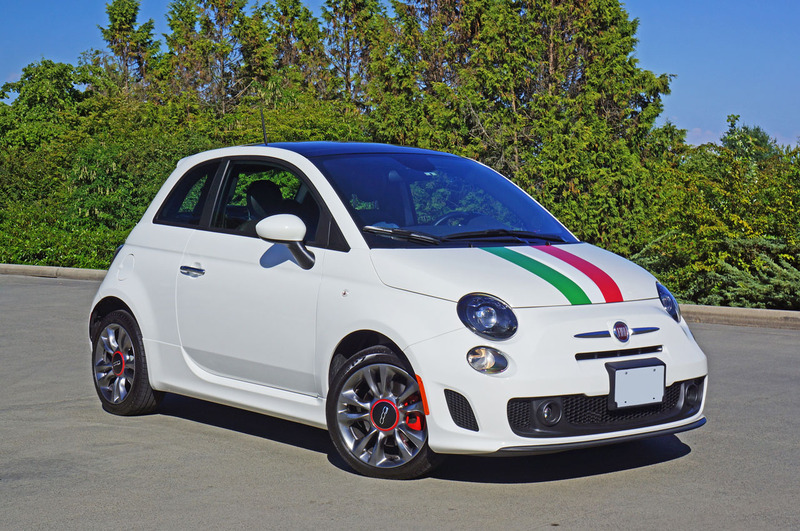 offers a sportier 500 Turbo that will do the job for just under $19k while you’re saving up for the world’s feistiest subcompact. 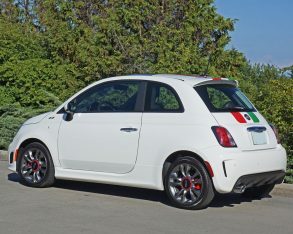 appropriately put up against the autobox equipped Abarth, but at 135 horsepower and 150 lb-ft of torque, which happens to be 34-percent more grunt than the regular 500, it’s still a formidable performer considering its feather-light mass, while larger half-shafts and heavy-duty constant velocity joints exorcise any potential torque steer demons out of the front-drive layout. 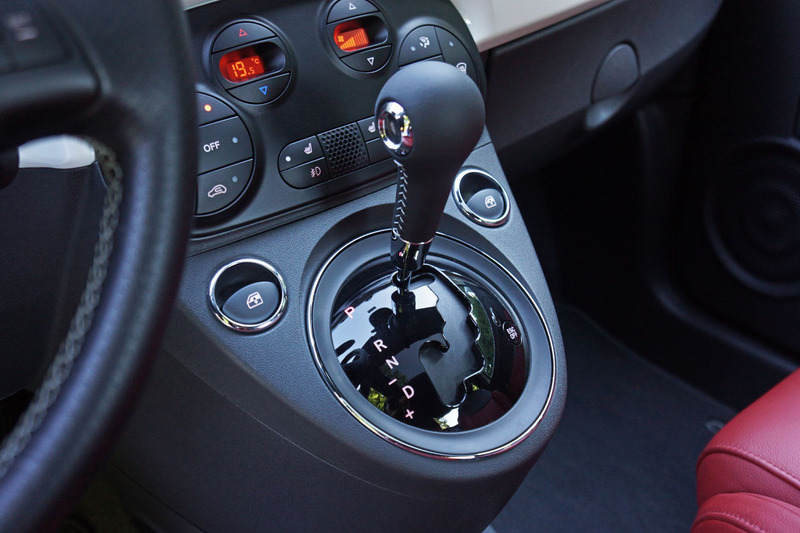 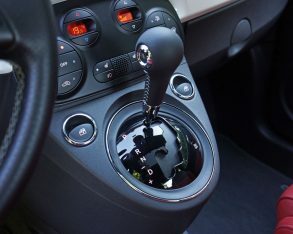 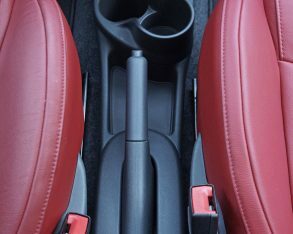 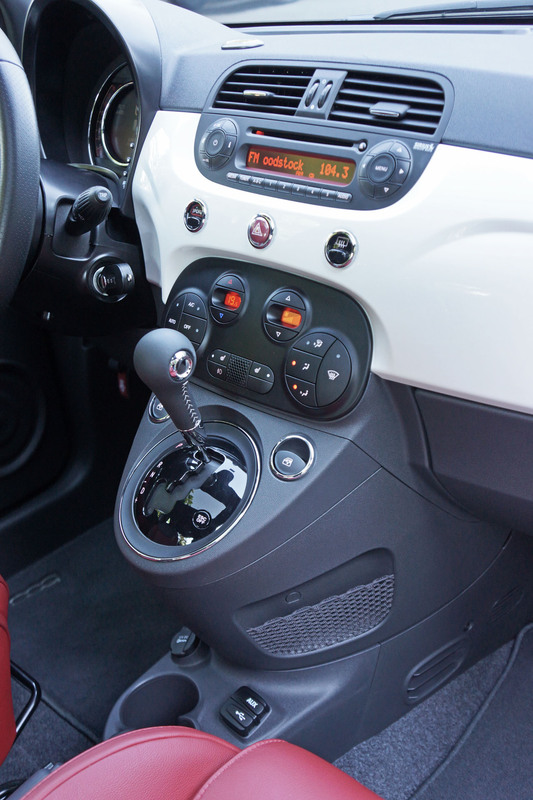 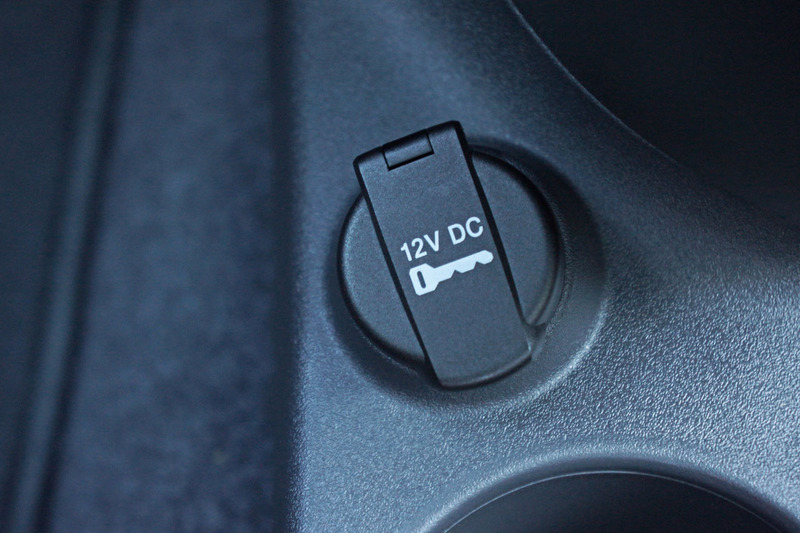 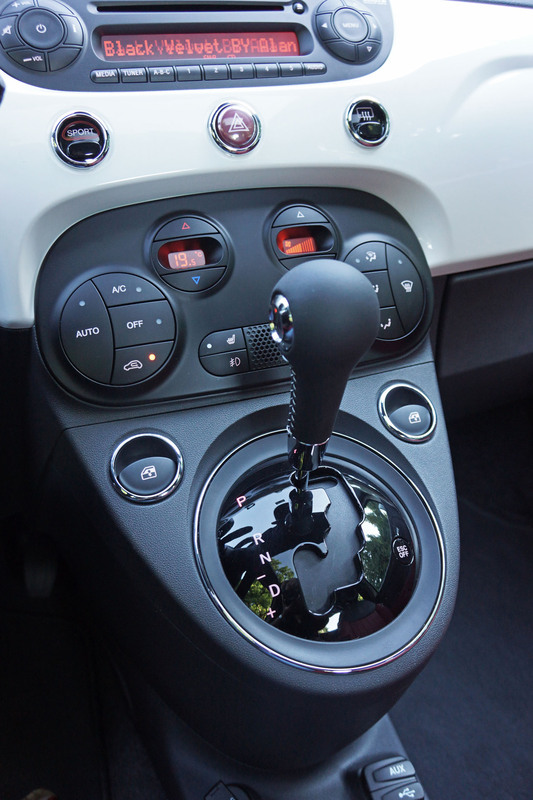 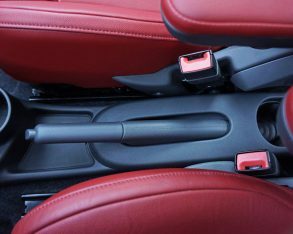 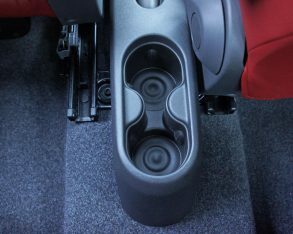 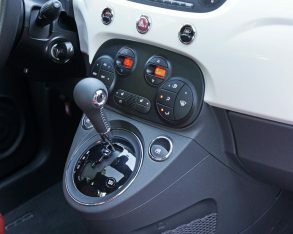 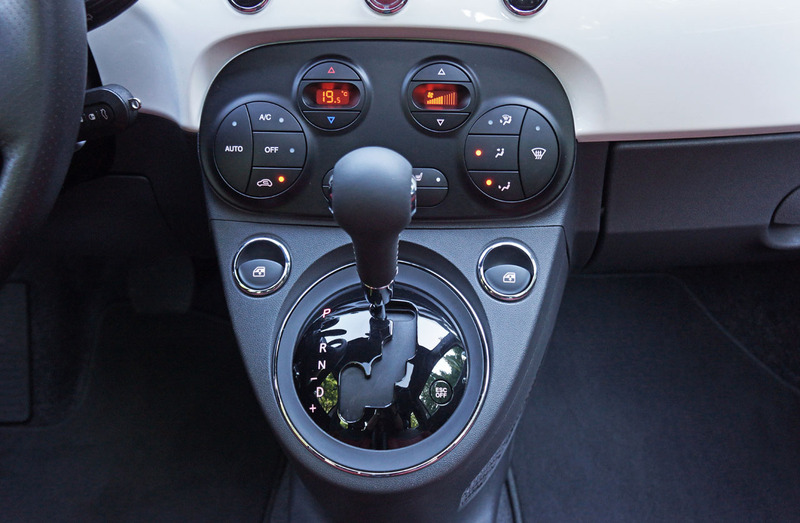 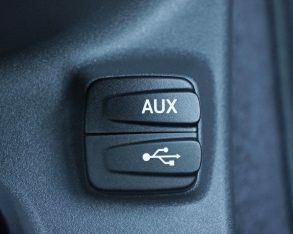 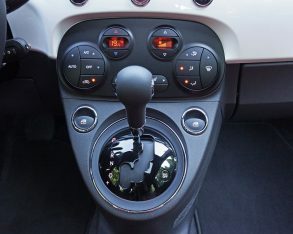 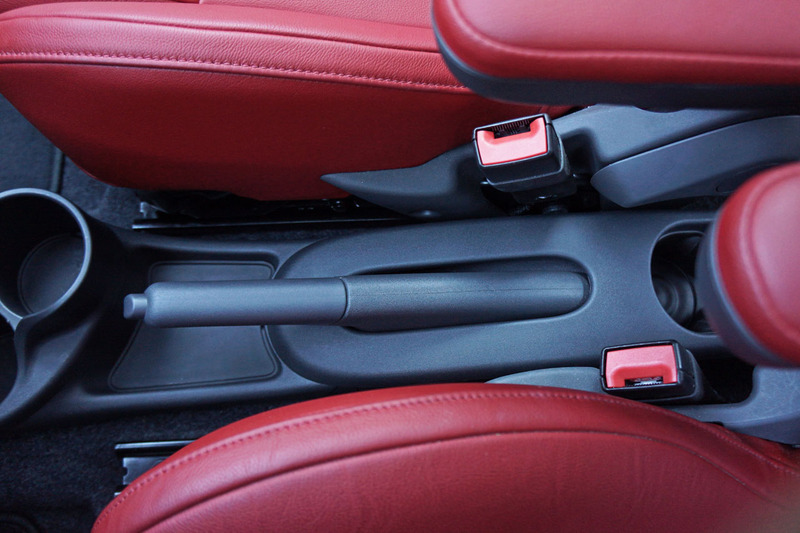 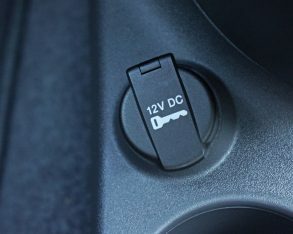 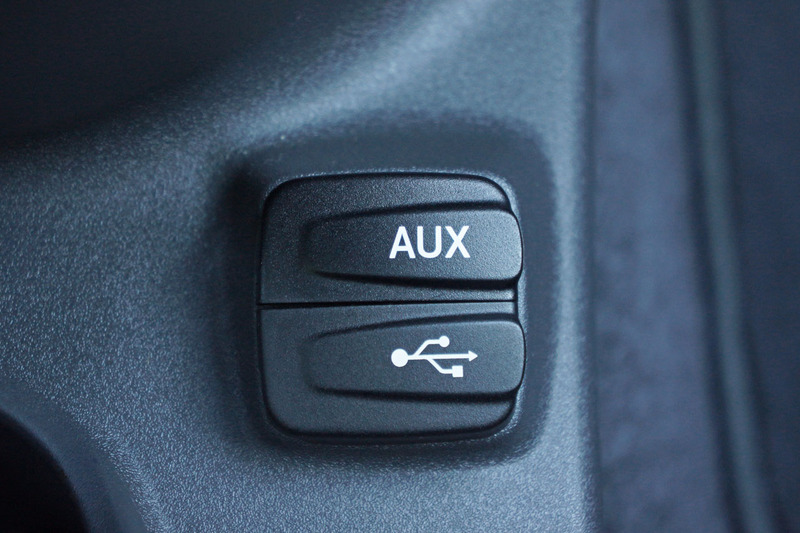 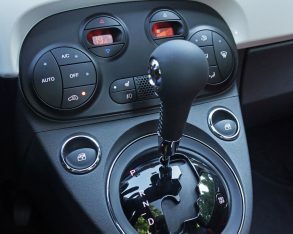 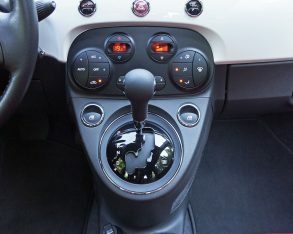 the cogs via the console-mounted shift lever, albeit causing the mighty mite to use a little more fuel as shown by its five-cycle EnerGuide rating of 9.6 L/100km in the city and 7.3 on the highway compared to 8.5 city and 6.9 highway for the five-speed equipped model. 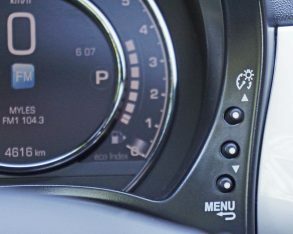 high-speed stability is superb. 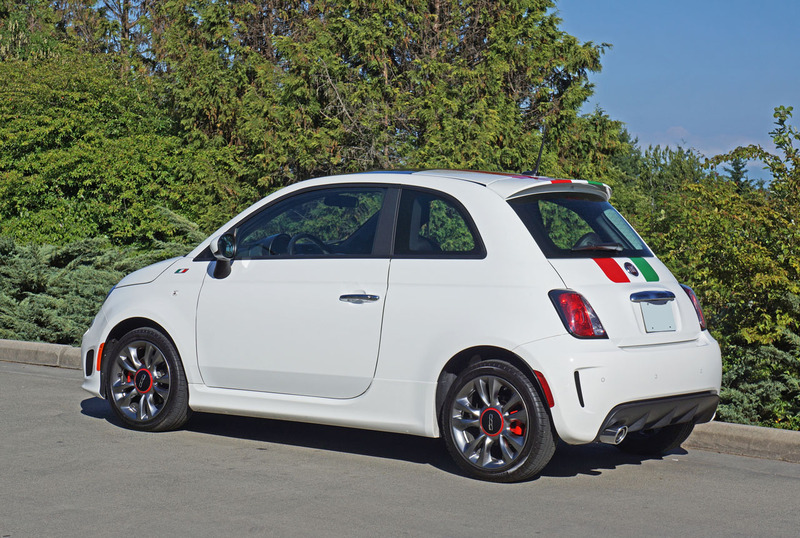 This is a car you can drive fast even if you’re an intermediate driver; it rewards bravery. 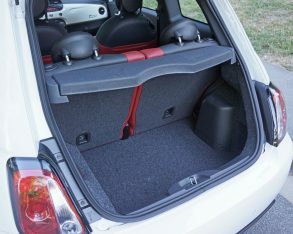 Then again city life is probably where the 500 Turbo is at its best, the tiny tot ideal for point and shoot traffic infiltration, capable of capitalizing on the smallest of openings before anything larger than a motorbike can react. 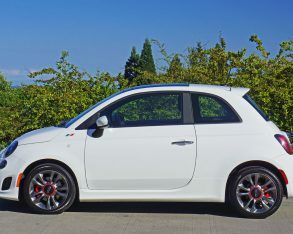 At the same time its turning circle is surprisingly tight. 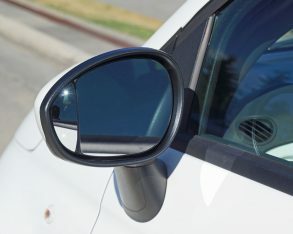 I did a U-turn in a parking lot and actually started to laugh, surprised at how easily it swapped ends. 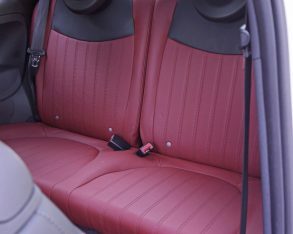 left untouched for a few moments before getting back on them again. 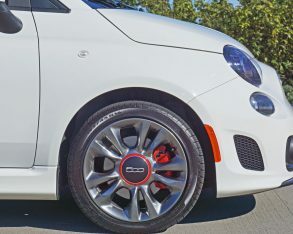 195/45R16 Pirelli P7s (the tires had to be Italian), not to mention bright red painted brake calipers peeking through from behind, giving the 500 Turbo a decidedly racy personality. 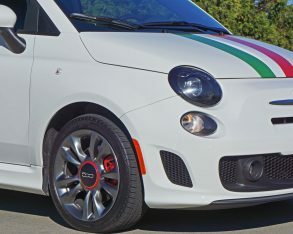 My tester’s Bianco (white) paint helped to show off some of the other sporty black elements too, like the mesh inserts in the lower grille opening, the lower lip spoiler, corner brake ducts, black glass roof, functional rear brake ducts, and large black diffuser on the lower bumper. 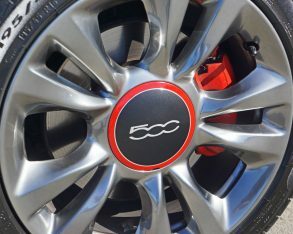 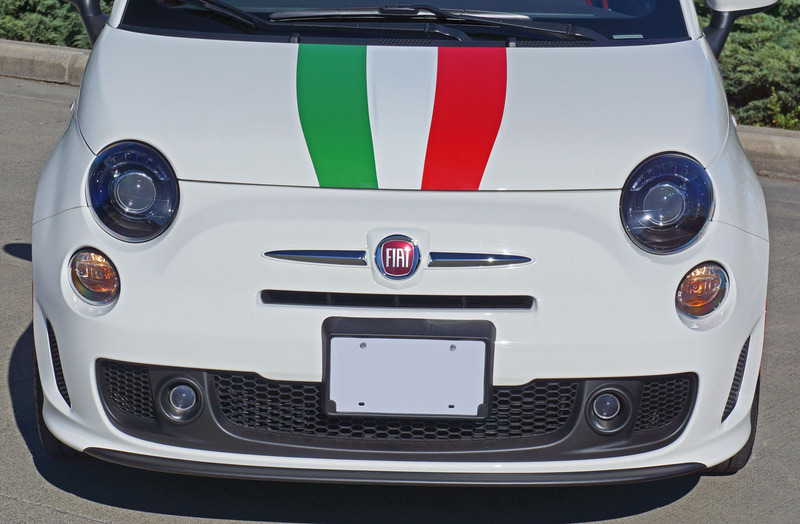 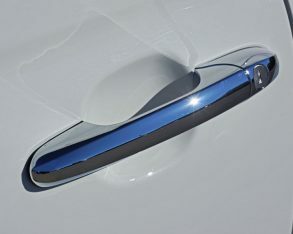 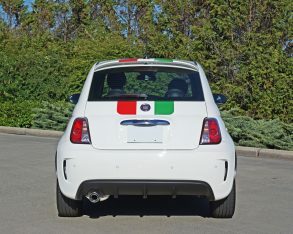 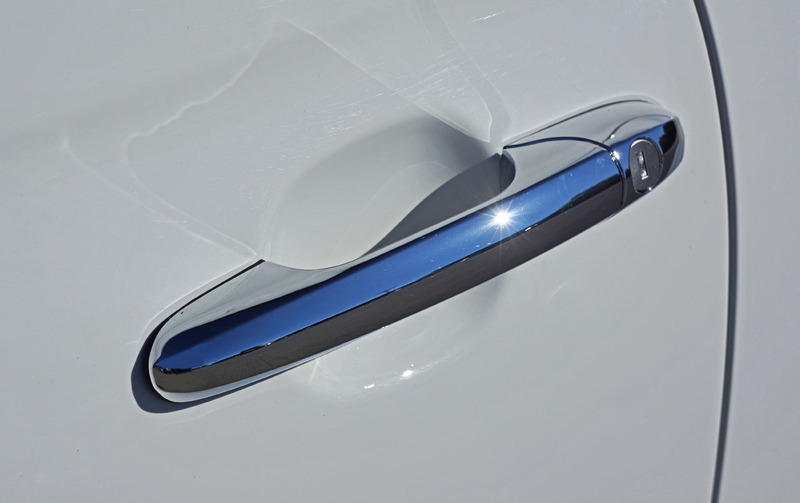 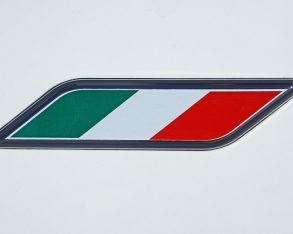 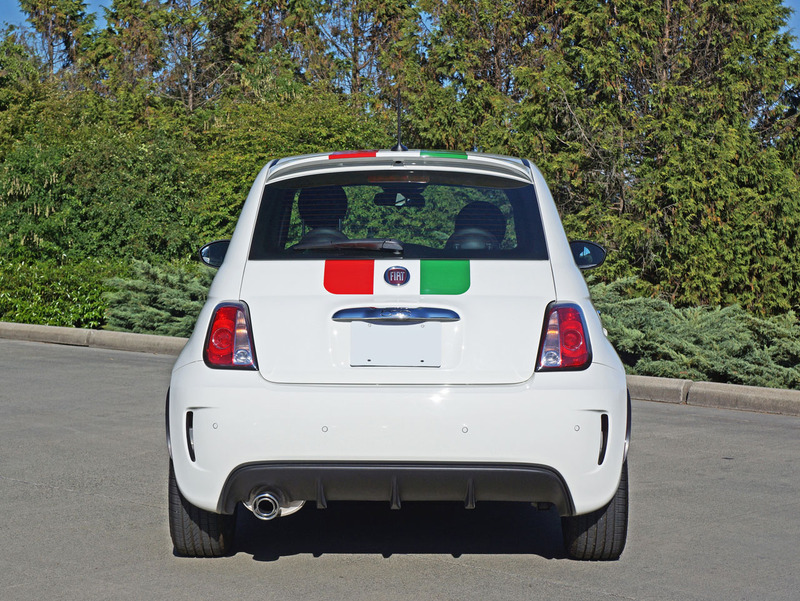 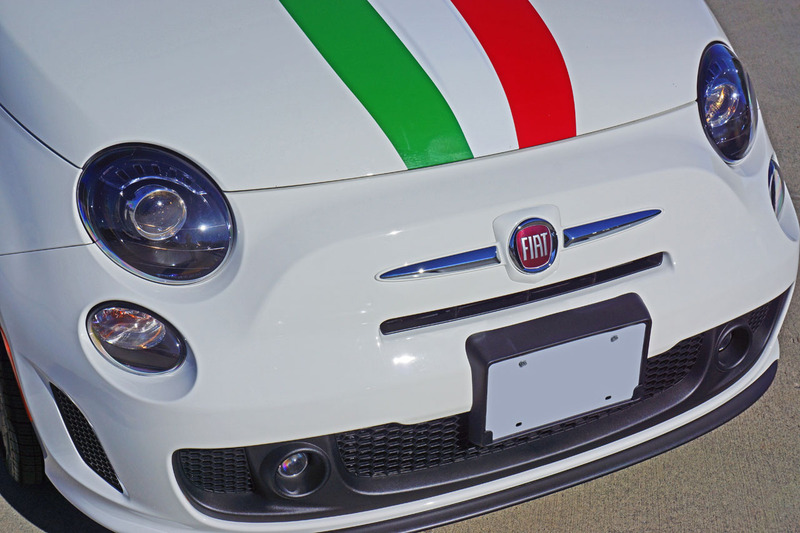 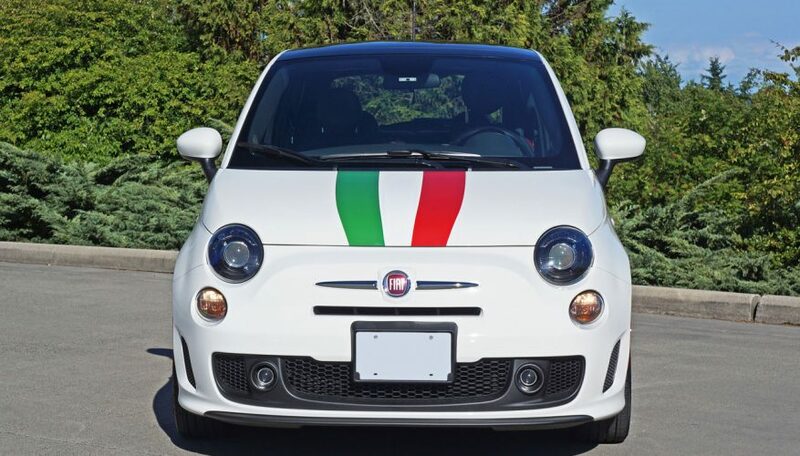 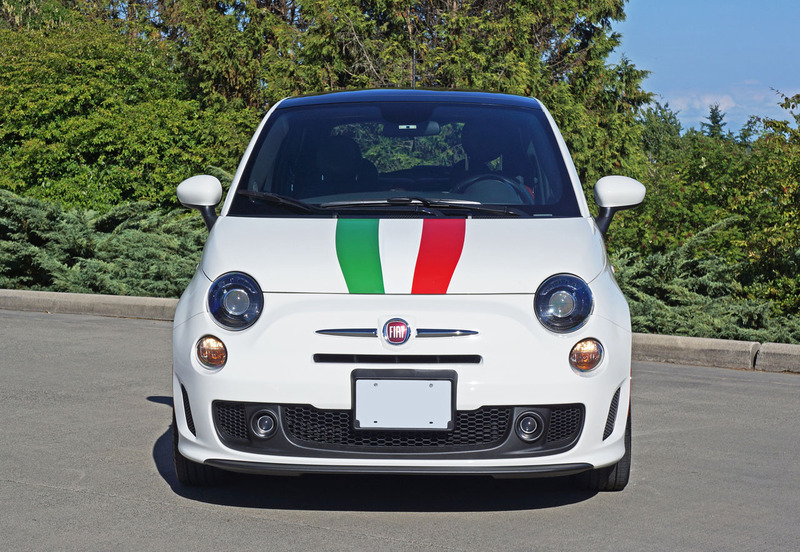 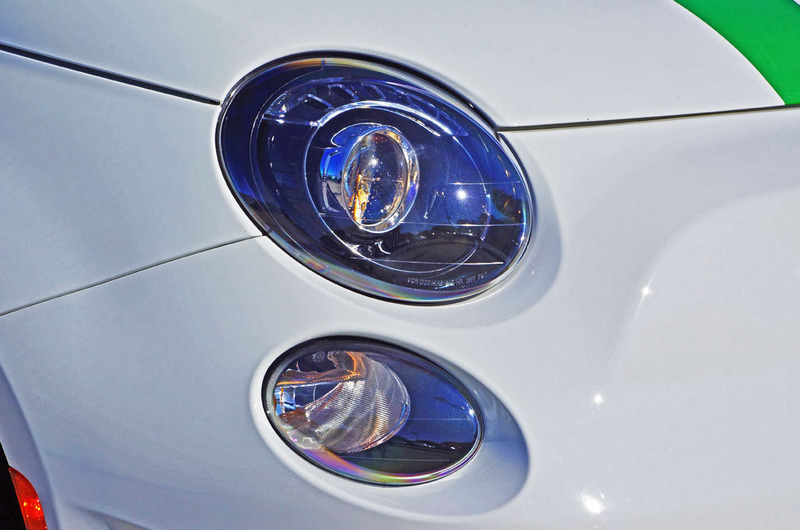 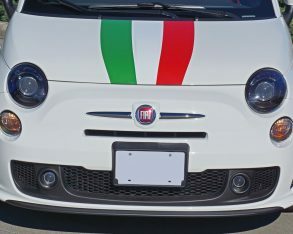 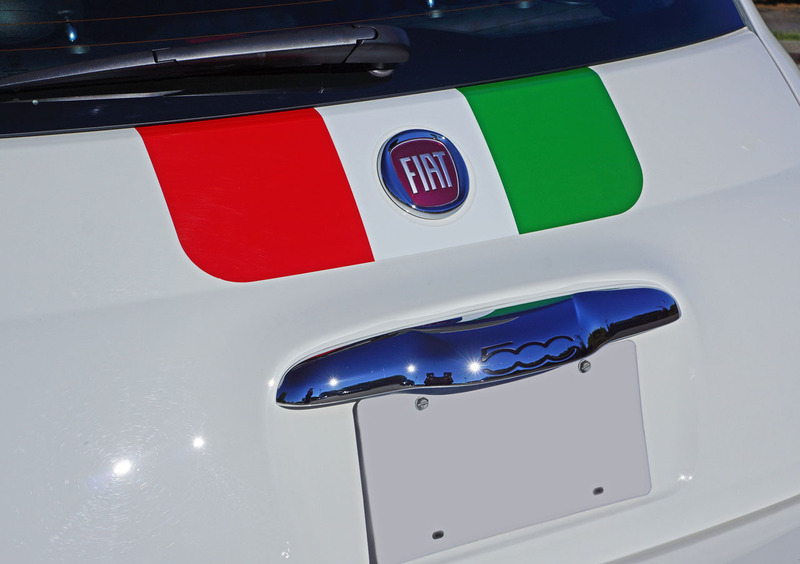 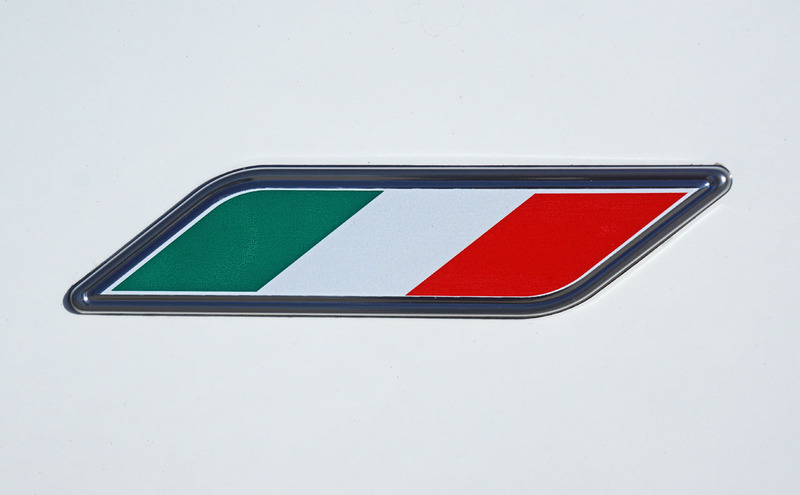 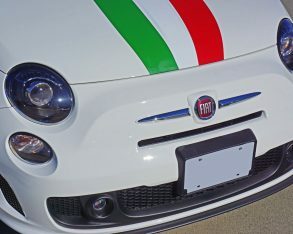 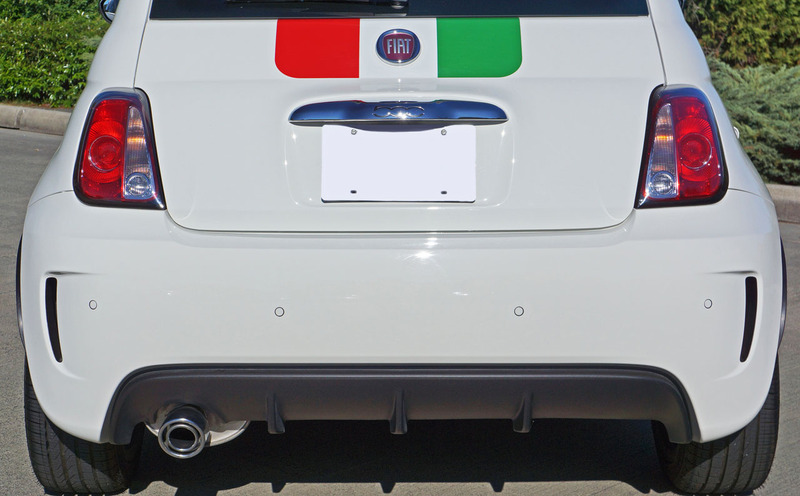 Of course, the 500 wouldn’t be a true retro without some chrome detailing as well, the winged Fiat badge up front, door handle trim, license plate light garnish at the rear, and exhaust tip, all looking suitably throwback, although an original Cinquecento wouldn’t have had so large a tailpipe. 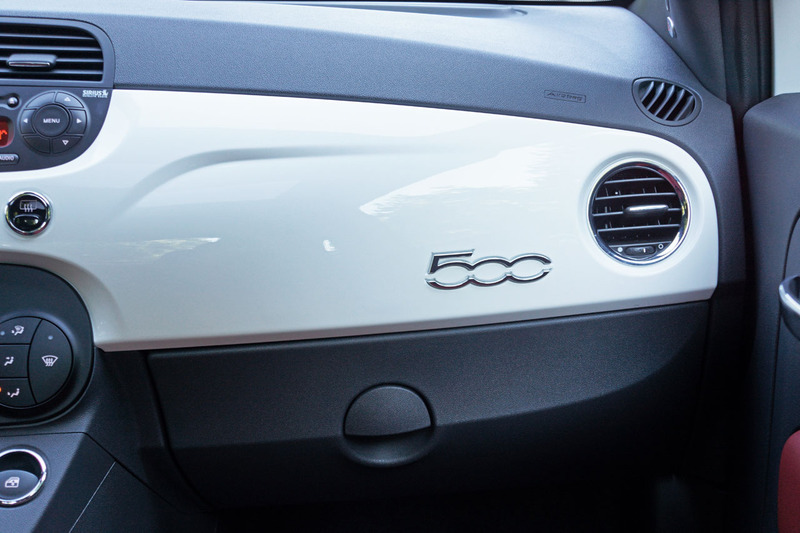 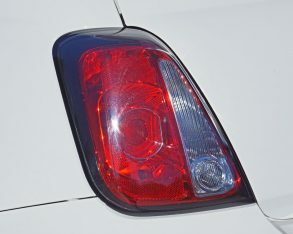 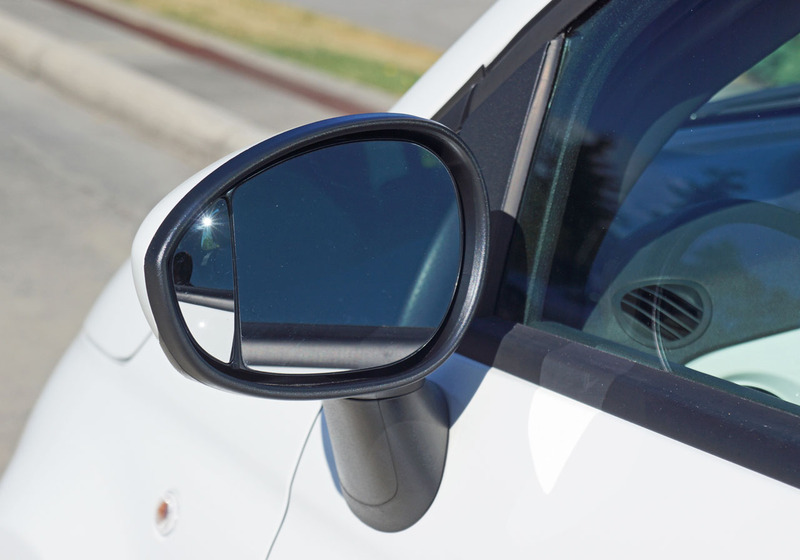 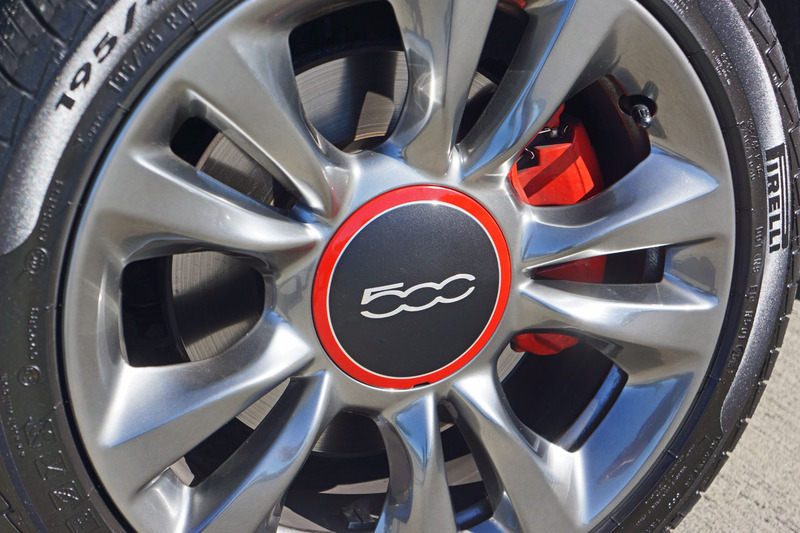 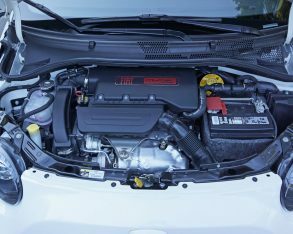 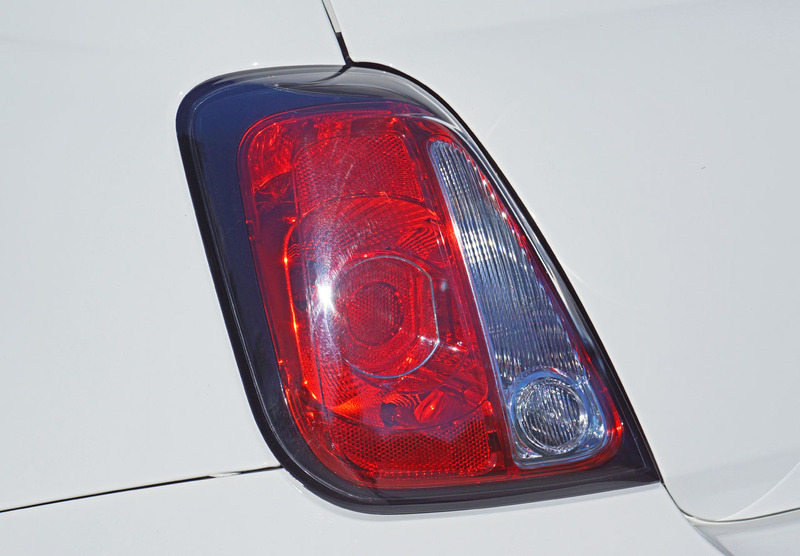 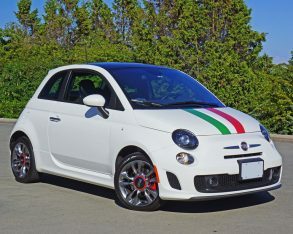 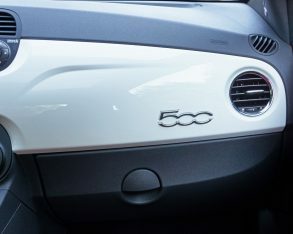 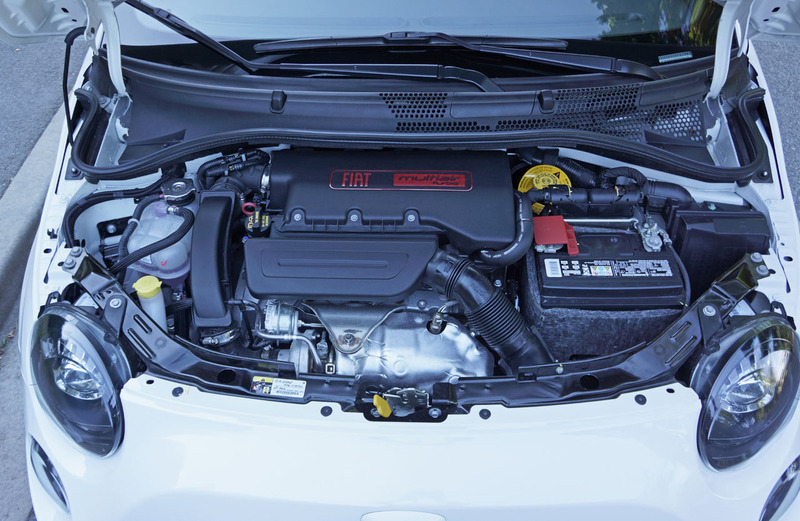 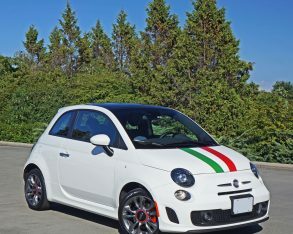 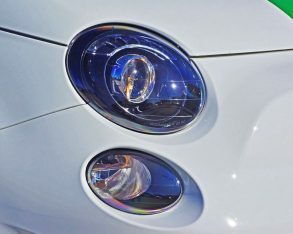 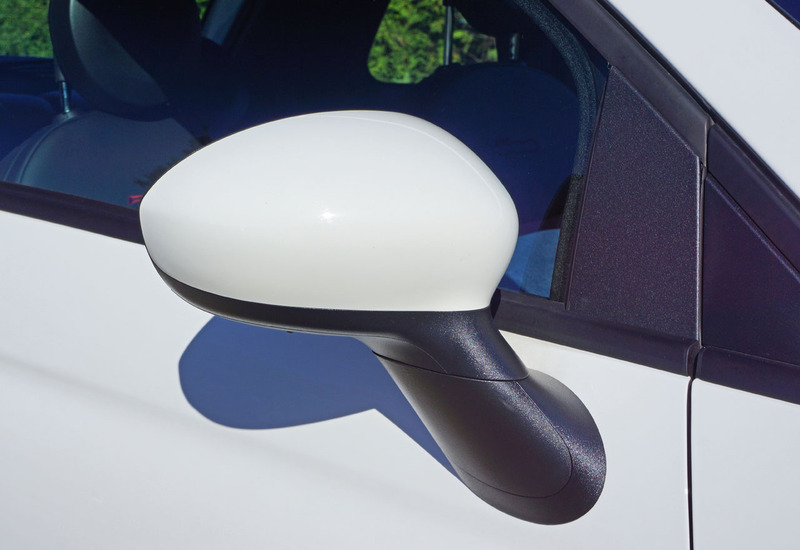 small as it is in today’s world, the new 500 is massive compared to the car emulates, its diminutive predecessor measuring just 2,969 millimeters (116.9 inches) long, 1,321 mm (52.0 inches) wide, and an identical 1,321 mm (52.0 inches) tall, while weighing just 499 kilograms (1,100 lbs). 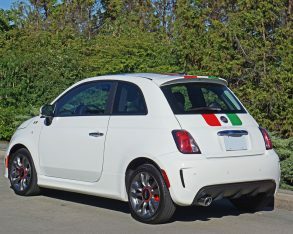 In comparison the new 500 stretches 3,546 mm (139.6 inches) from head to tail, 1,627 mm (64.1 inches) from side to side and 1,488 mm (58.6 inches) from top to bottom, its North American-spec curb weight being 1,072 kilos (2,363 lbs) at its lightest and 1,149 kg (2,533 lbs) when fully optioned out, as noted earlier light as a feather compared to its contemporaries yet more than twice the weight of the original. 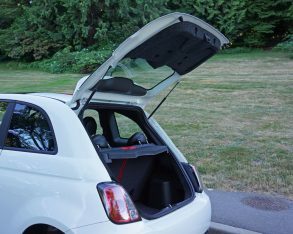 Such are the realities of the day, from safety concerns to expectations for real four-place capacity, it’s necessarily larger. 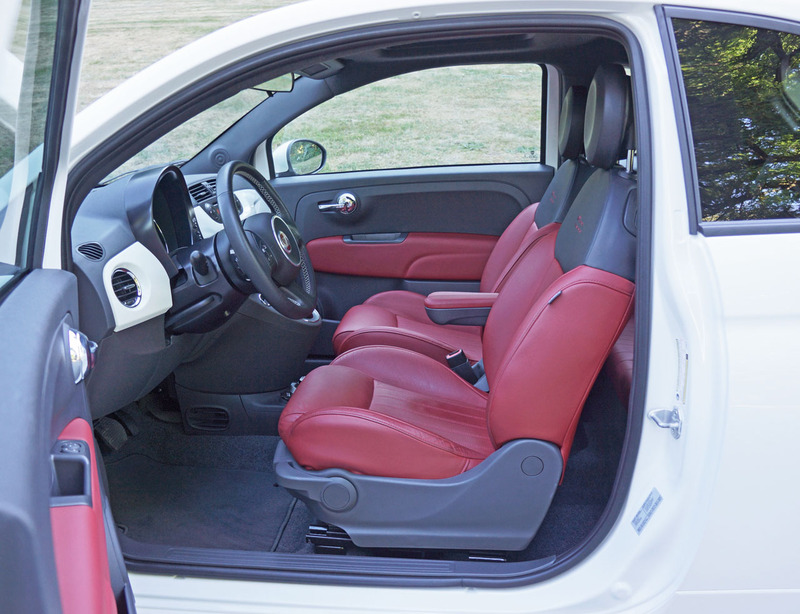 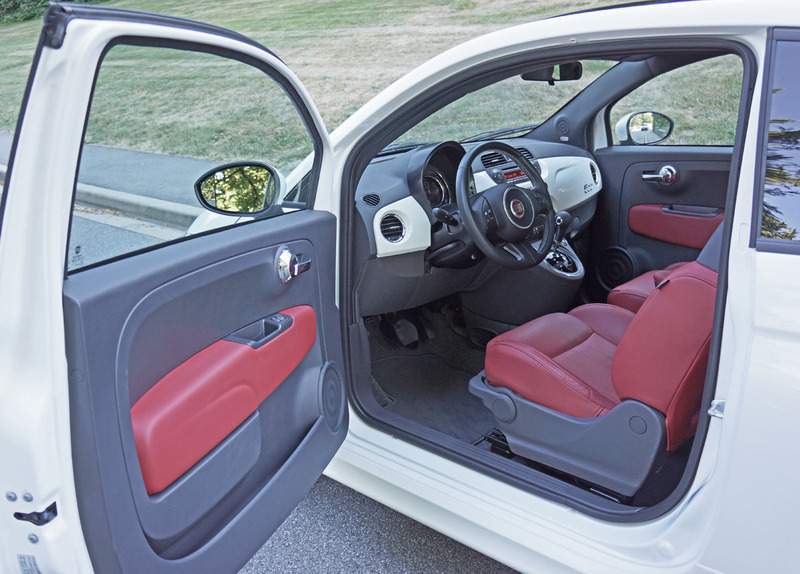 Just the same you’ll be hard pressed to find many smaller four-seat hatchbacks. 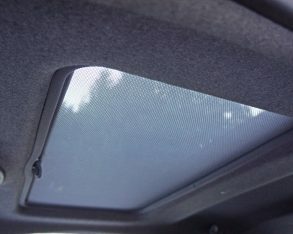 into the kids noggins. 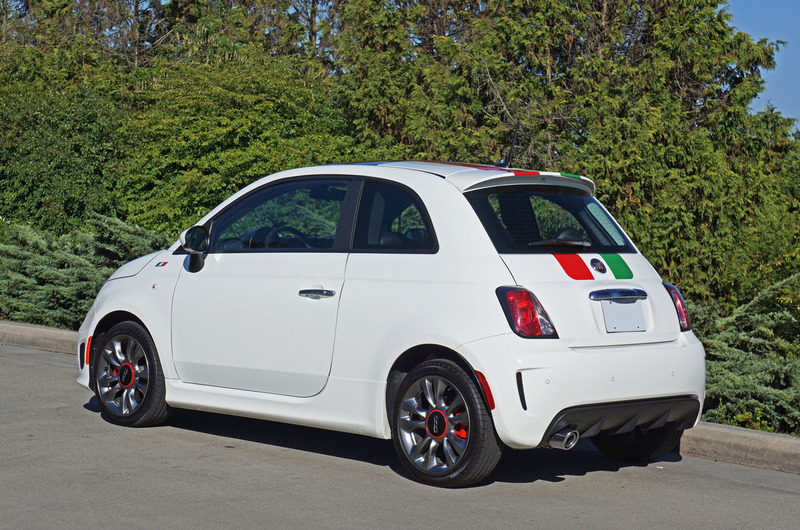 I’ve since tested a 2013 500C Abarth and 2014 500C Lounge (plus a larger 2014 500L), and I must admit that I’ve enjoyed every one of them. 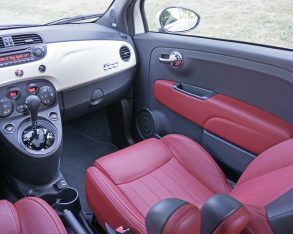 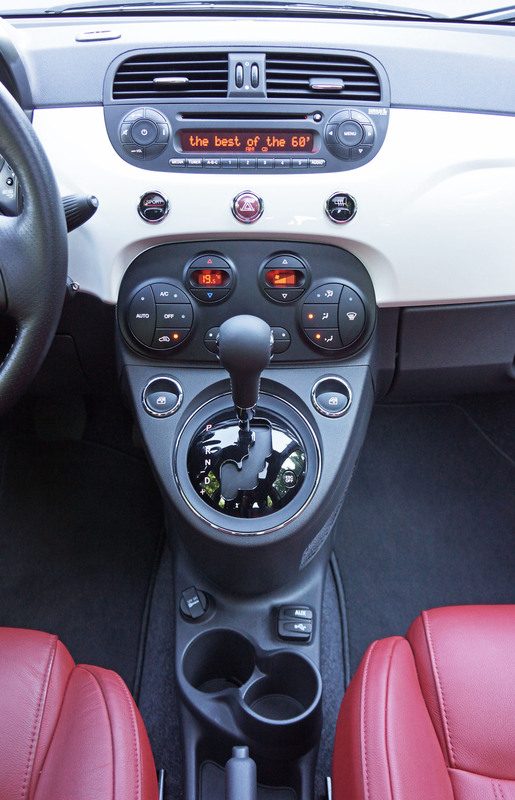 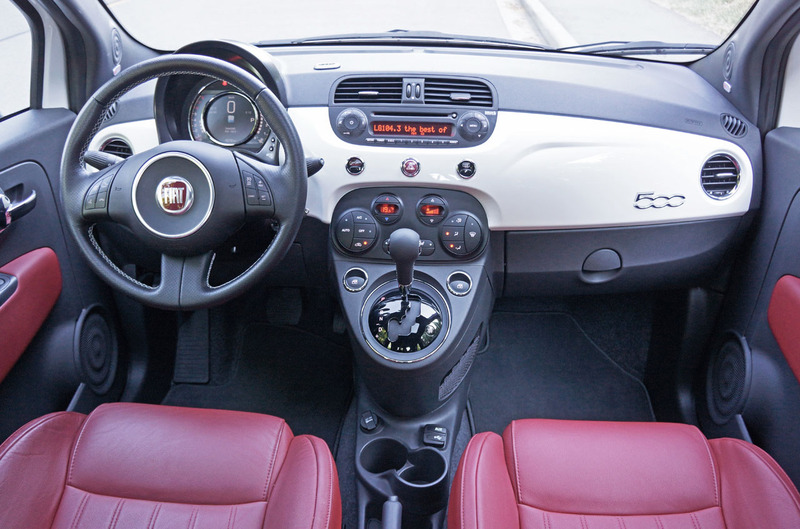 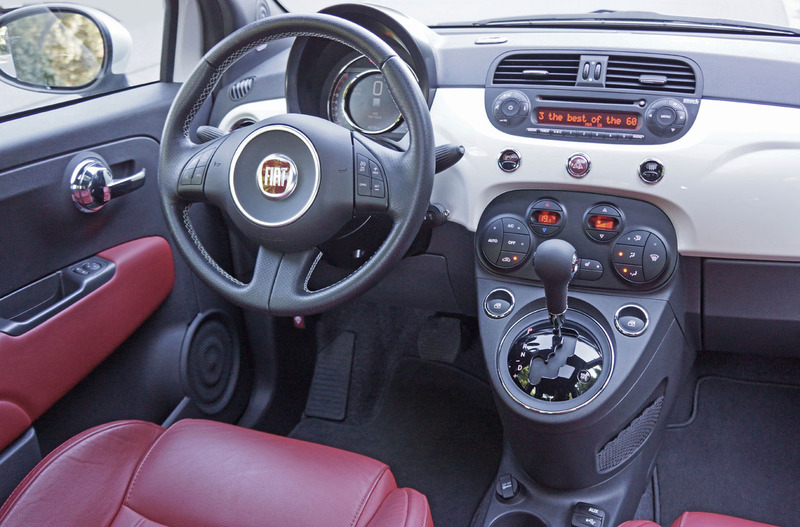 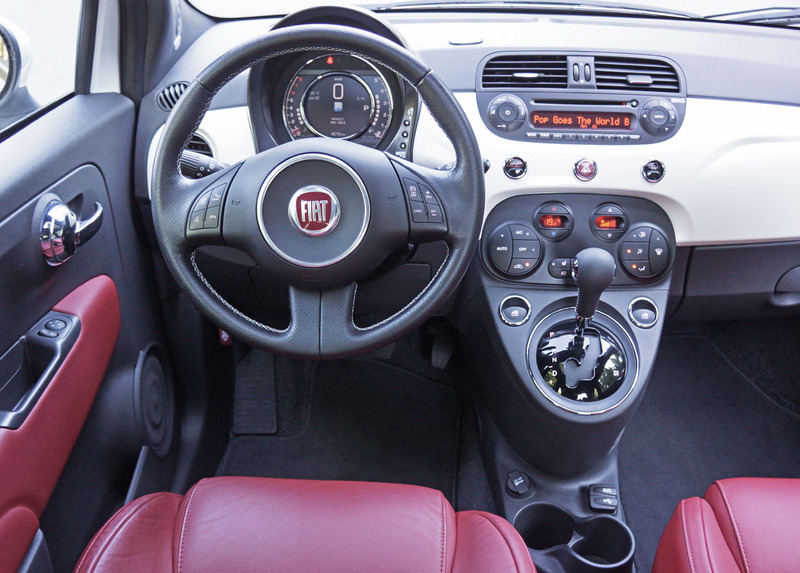 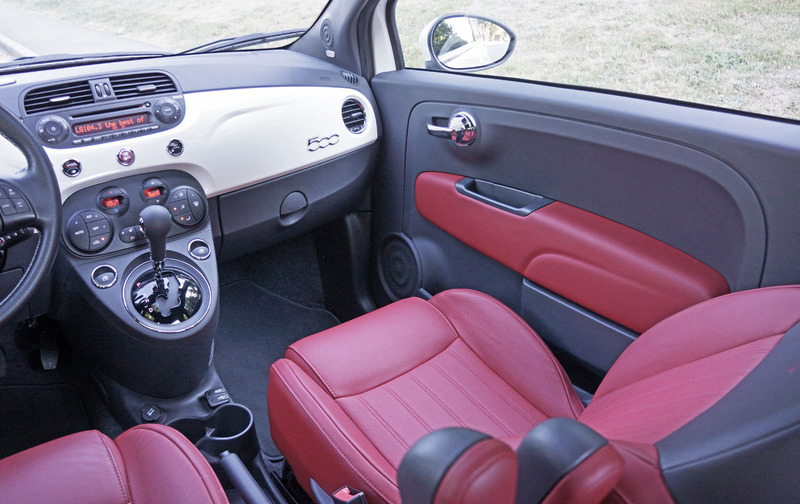 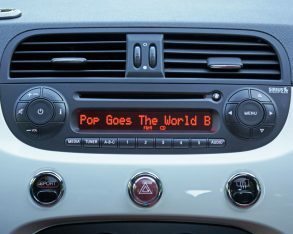 Part of the love affair with the 500 is its interior, which is a mix of high-tech and yesteryear all rolled up into one. 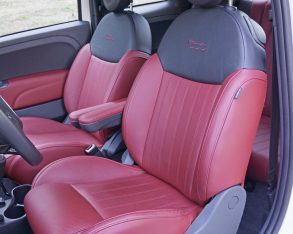 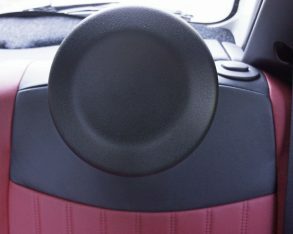 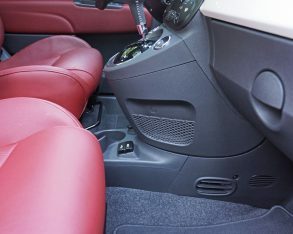 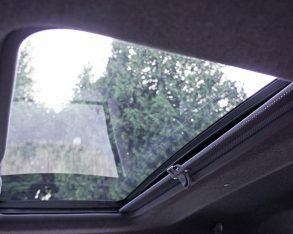 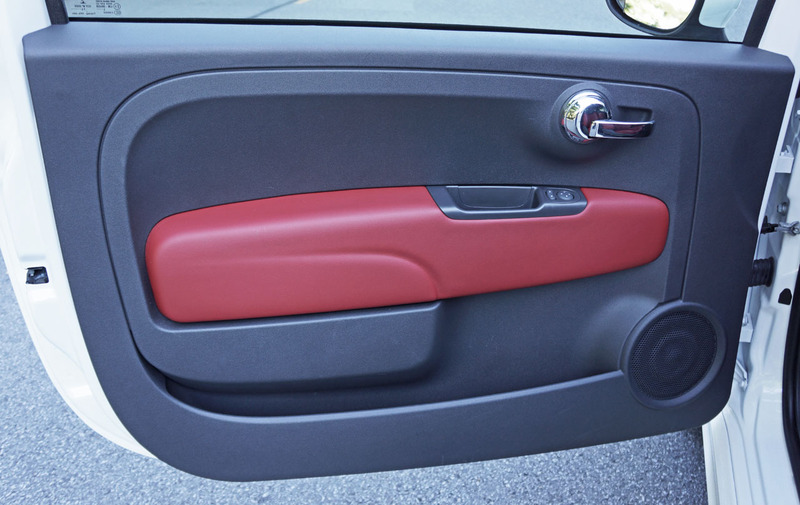 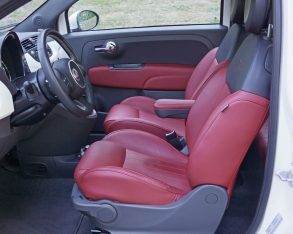 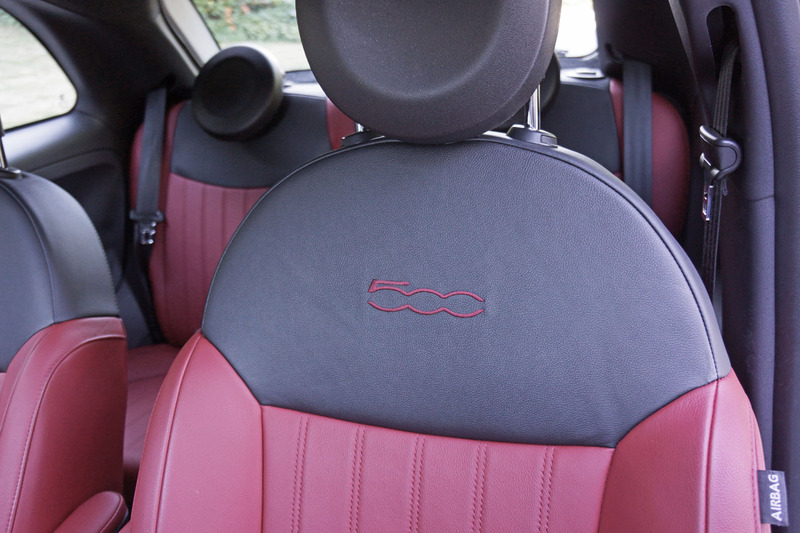 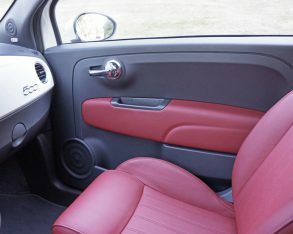 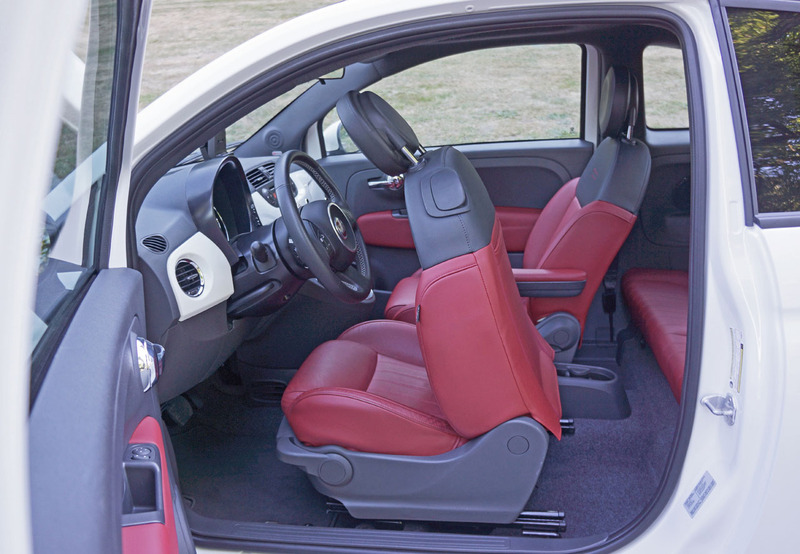 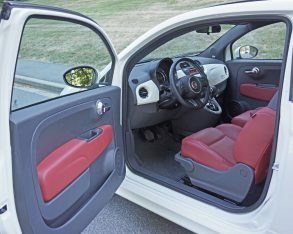 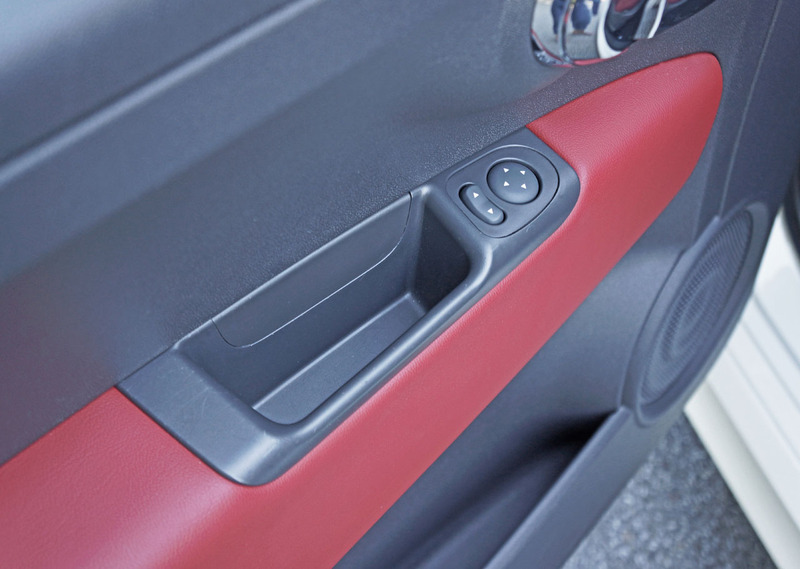 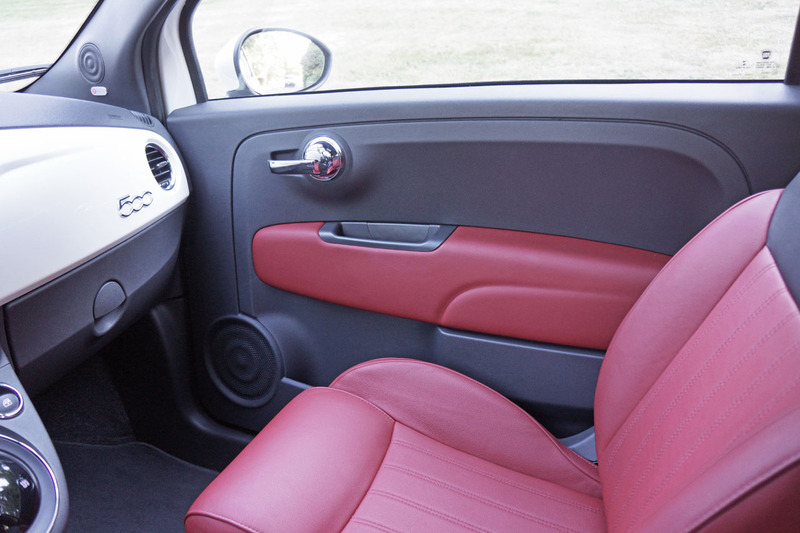 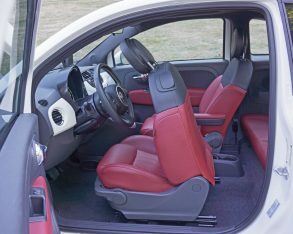 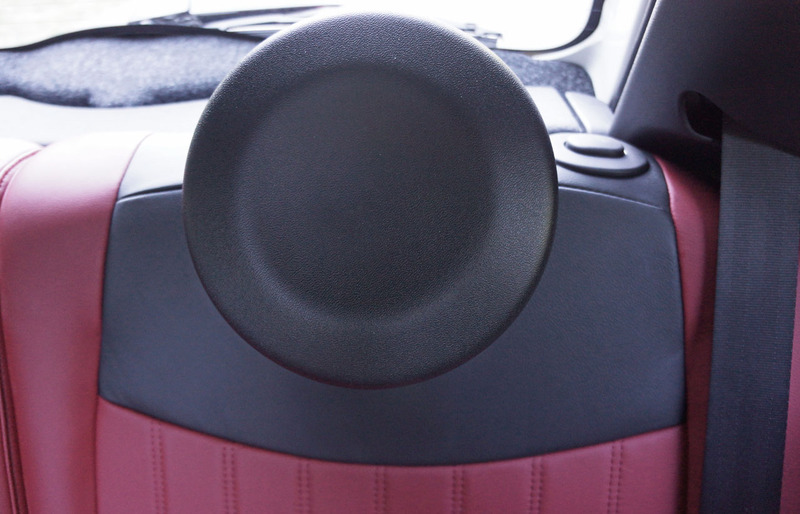 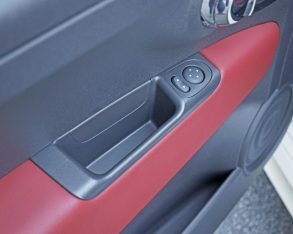 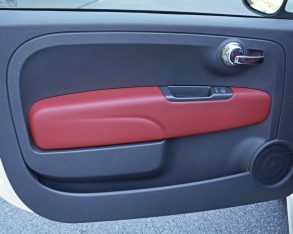 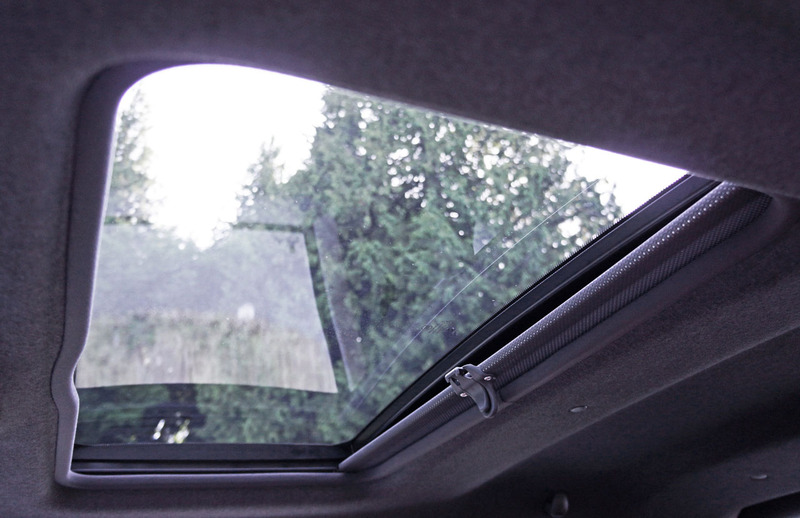 Fiat doesn’t waste money on soft-touch synthetic surfaces, the dash top harder yet still made from a nice looking textured matte finish plastic, as are the door uppers and pretty well everywhere else that’s not covered in fabulous looking body-coloured plastic surfacing. 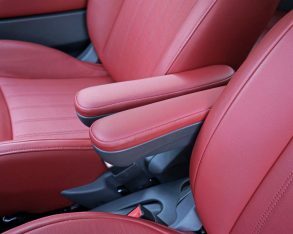 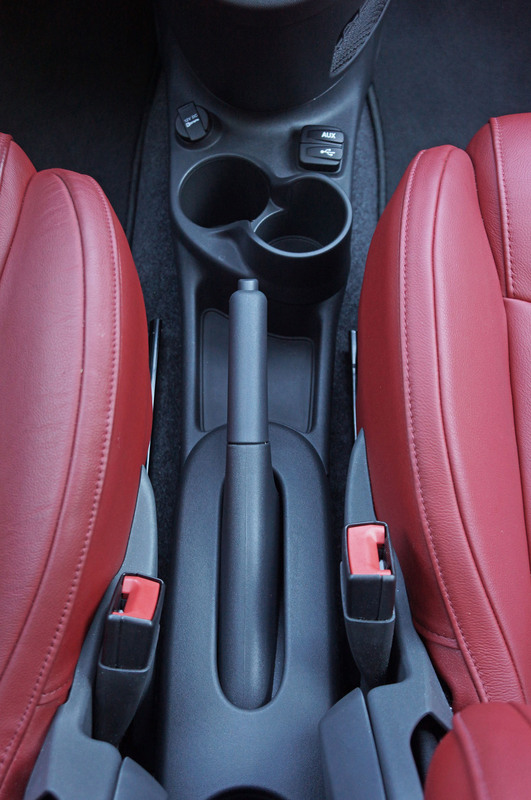 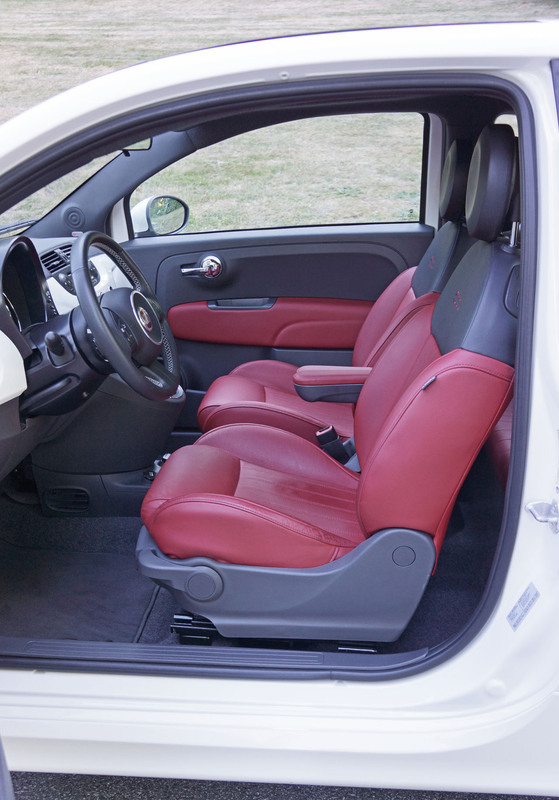 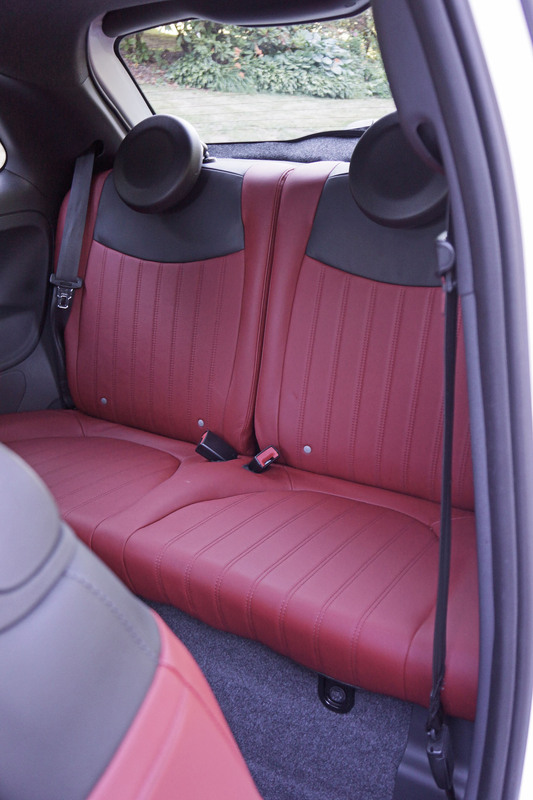 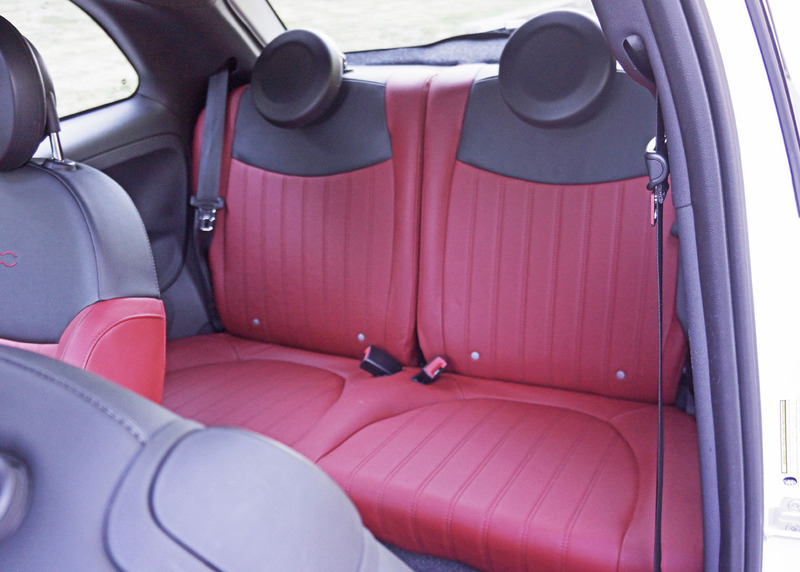 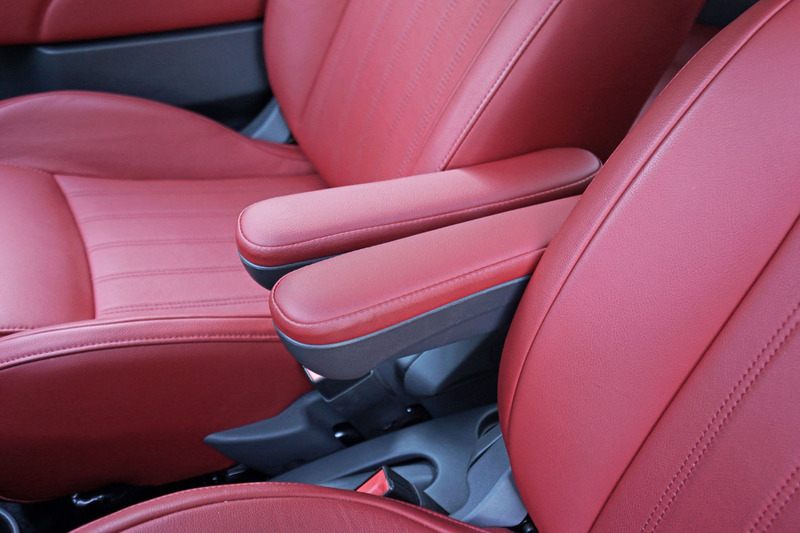 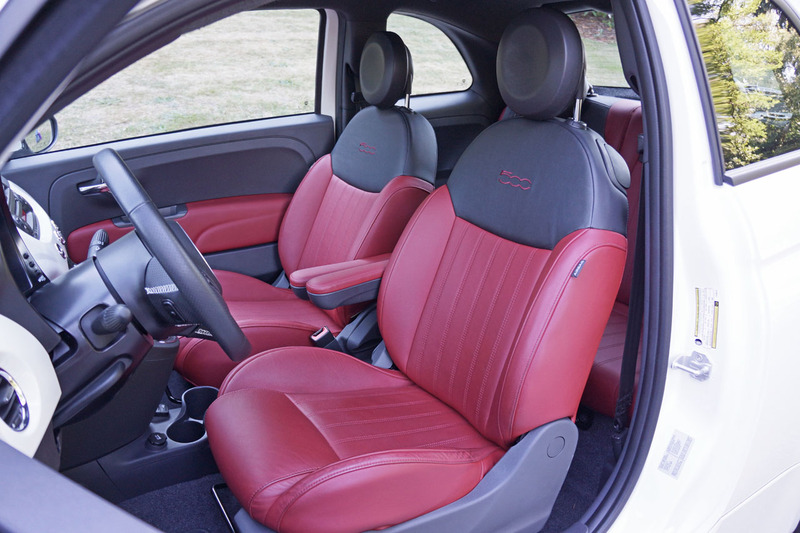 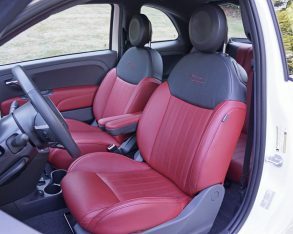 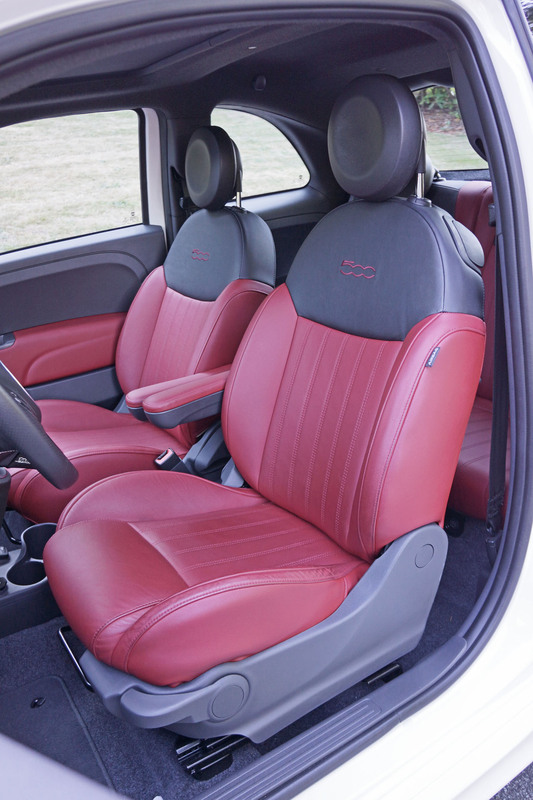 Only the armrests are appropriately cushy, although not as comforting as my tester’s optional sporty leather seats. 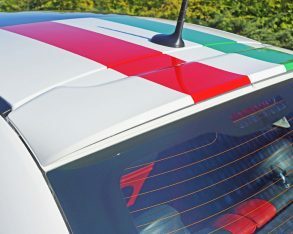 This example received a stylish body-colour white, Rosso (red) and black interior motif that looked particularly festive and as period correct as one could hope for. 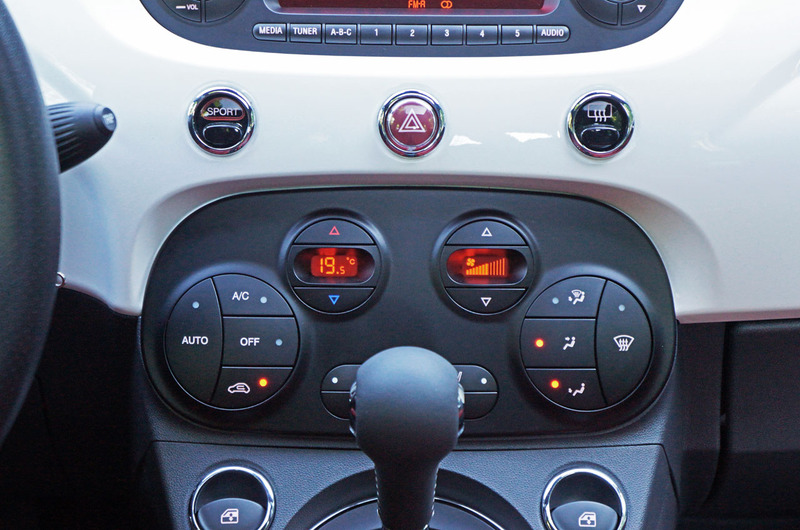 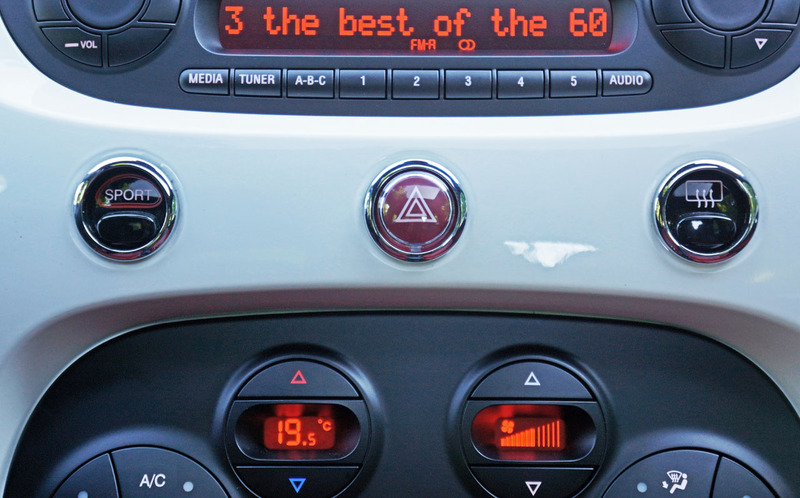 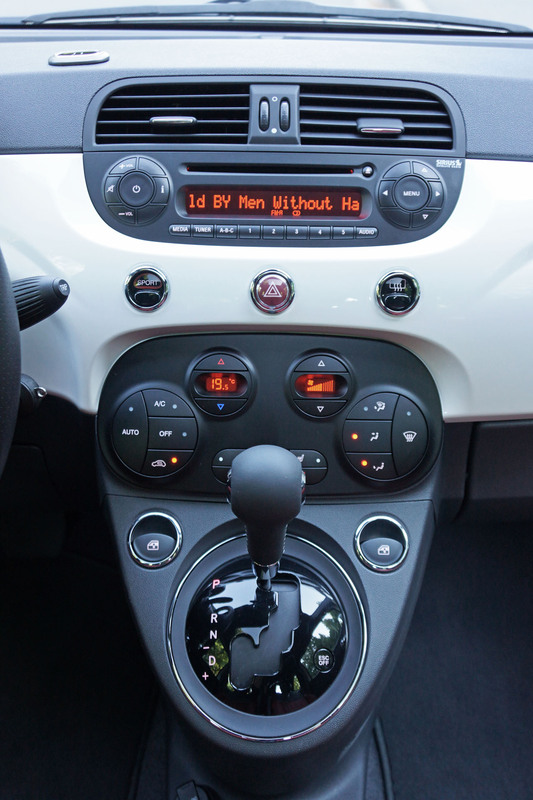 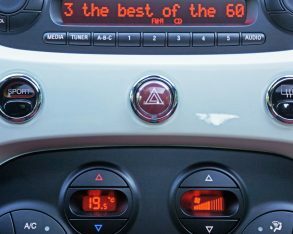 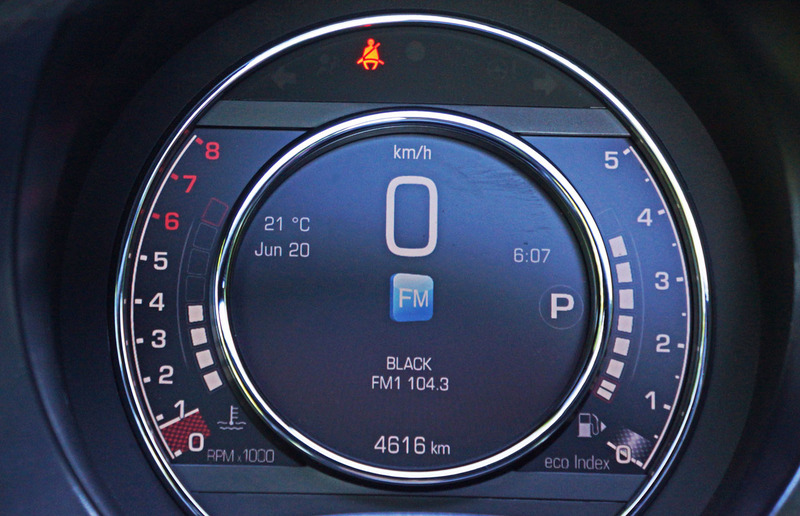 switchgear is good for the class, while orange on black LCD displays fill the dual-pod centre stack. 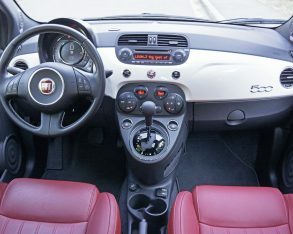 They’re not the big screens as found with some others, but that likely wouldn’t suit the 500’s style, and besides Fiat has bored a hole atop the dash for a custom-made smartphone holder that should be much more useful to most buyers than an expensive navigation-packed infotainment system upgrade. 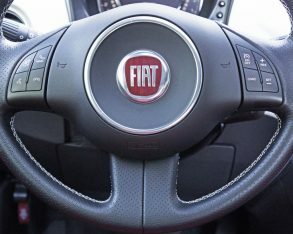 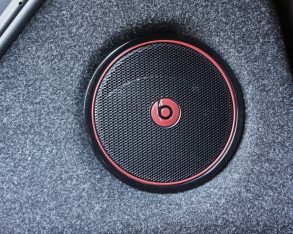 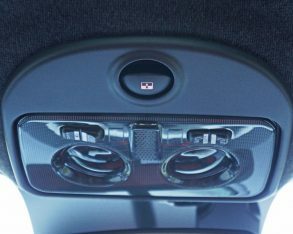 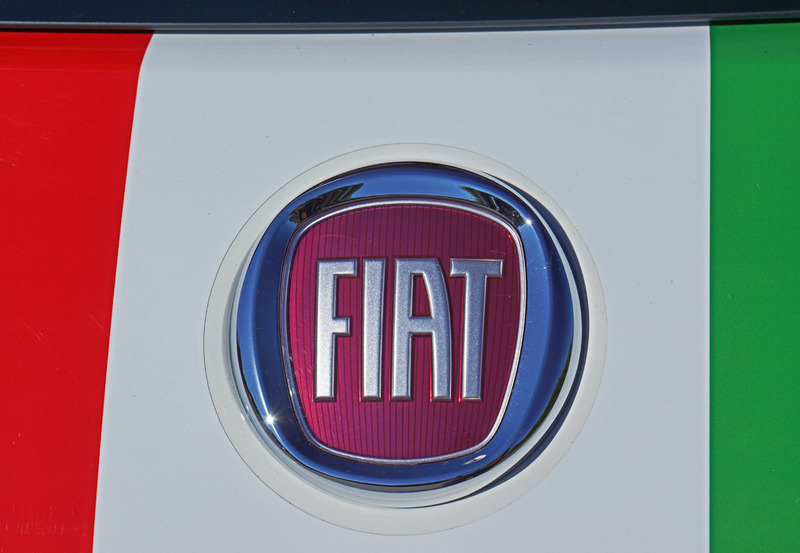 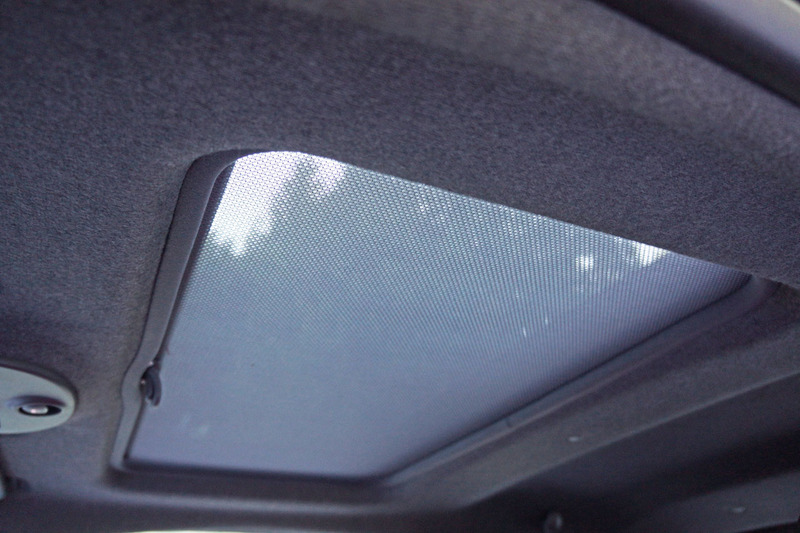 This said Fiat does offer a $495 optional TomTom navigation system that also fits into that slot. 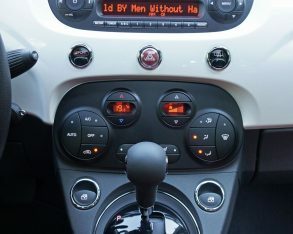 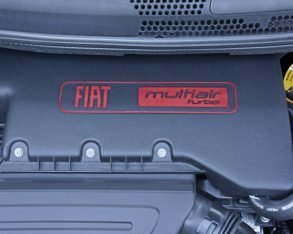 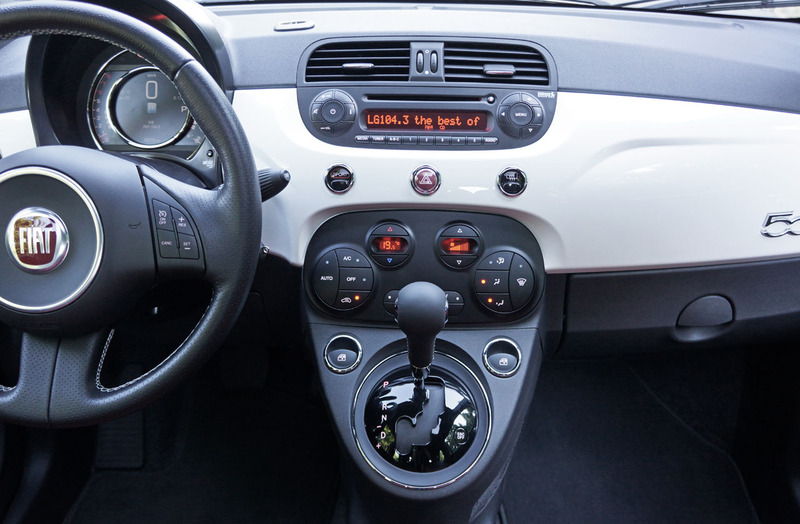 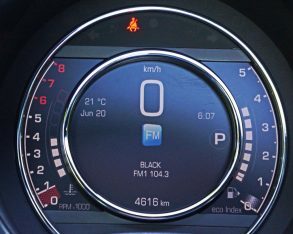 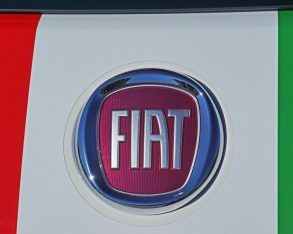 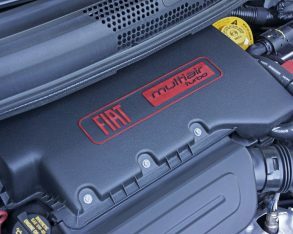 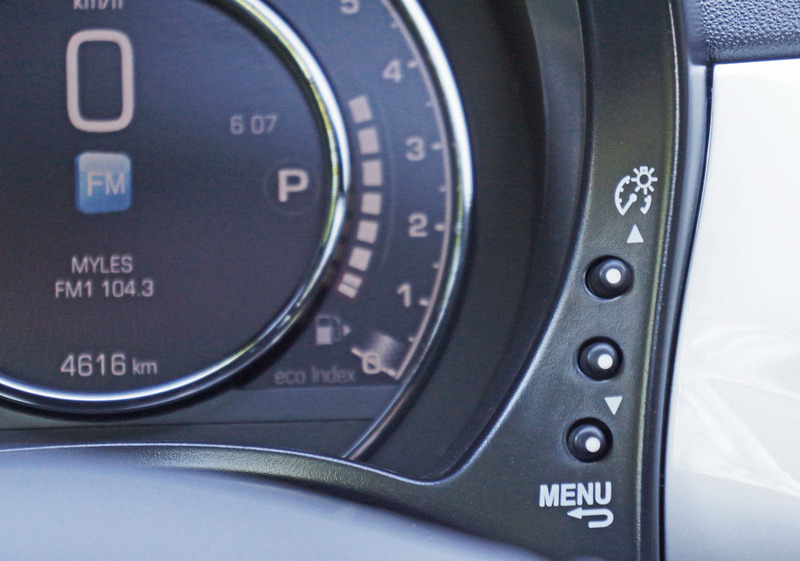 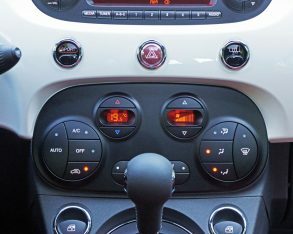 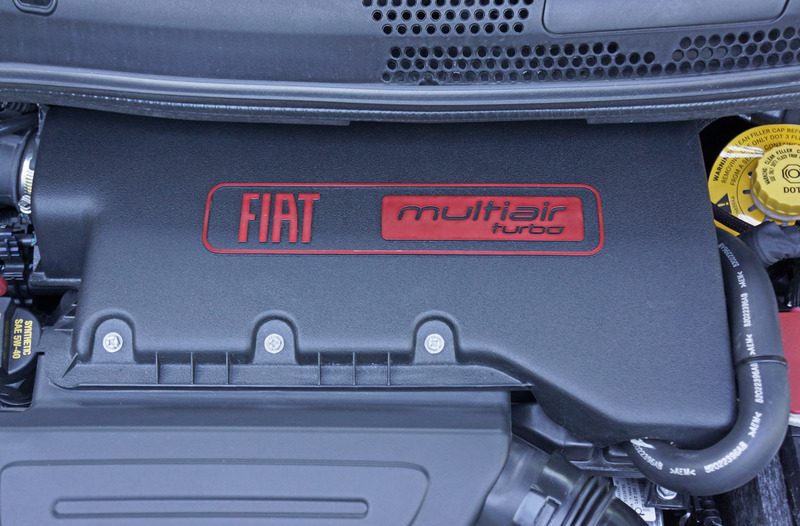 Additionally, Fiat fills the primary gauge package with an ultra-sharp seven-inch customizable digital display featuring a scrolling tachometer on the left, large fuel gauge on the right, and big speedo numerals at centre, all surrounded by various other readouts. 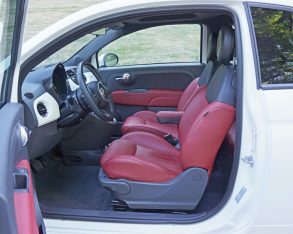 It’s a wonderfully efficient setup that’s as modern as anything on the market, yet neatly fits within the 500’s classic oval shroud. 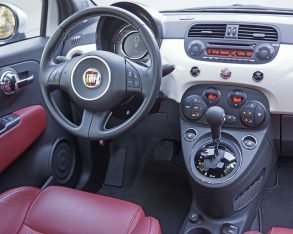 silver-stitched leather-wrapped sport steering wheel is a lovely bit of kit too, as is the shifter knob with the same silver threading, while my tester’s red and black leather seats, complete with contrasting embroidered “500” badging on their upper portions, looked sensational and were amply comfortable with decent lateral and good fixed lumbar support plus a useful driver’s seat height adjuster, whereas the seats in the rear featured those same form over function headrests mentioned earlier. 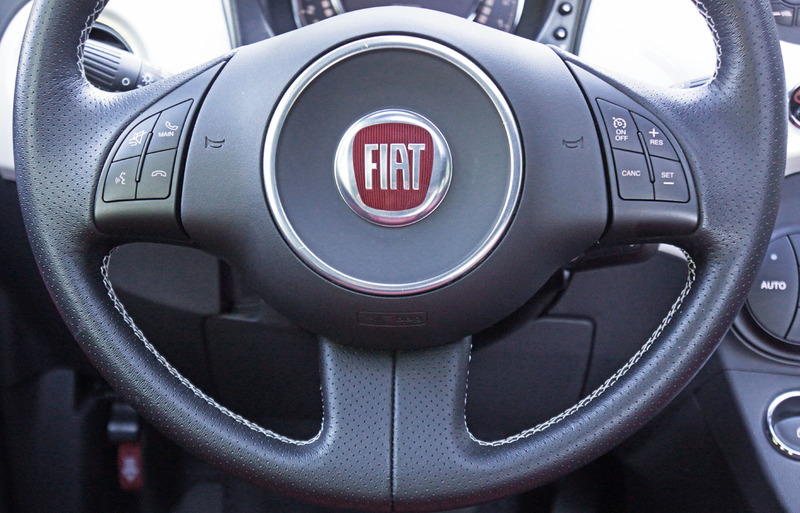 reseating yourself up front is an easy process. 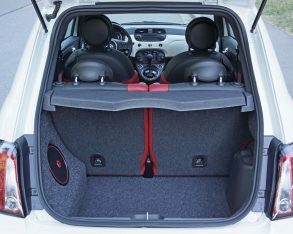 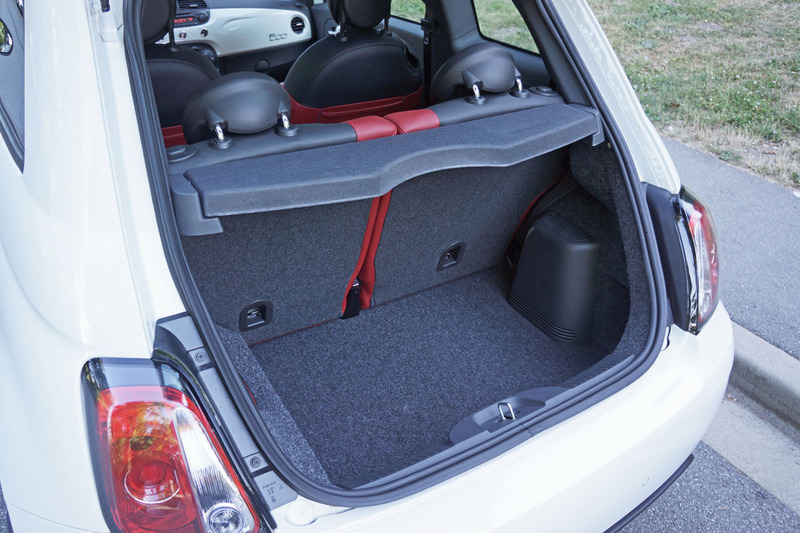 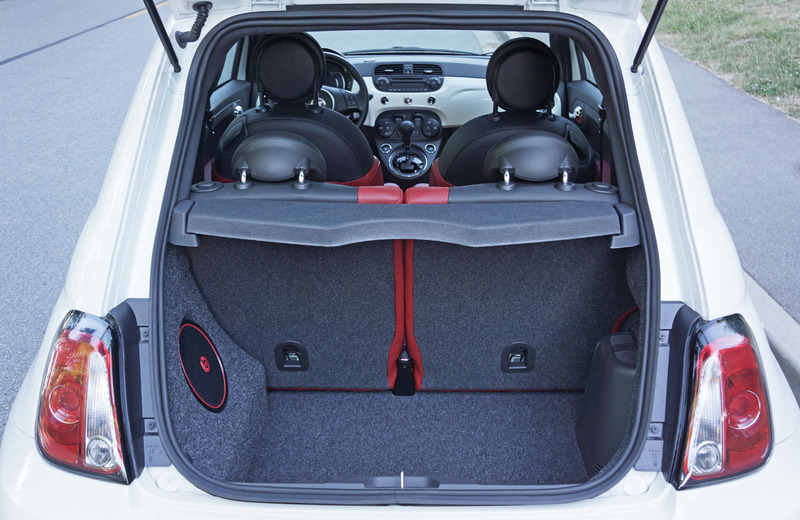 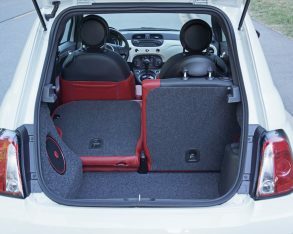 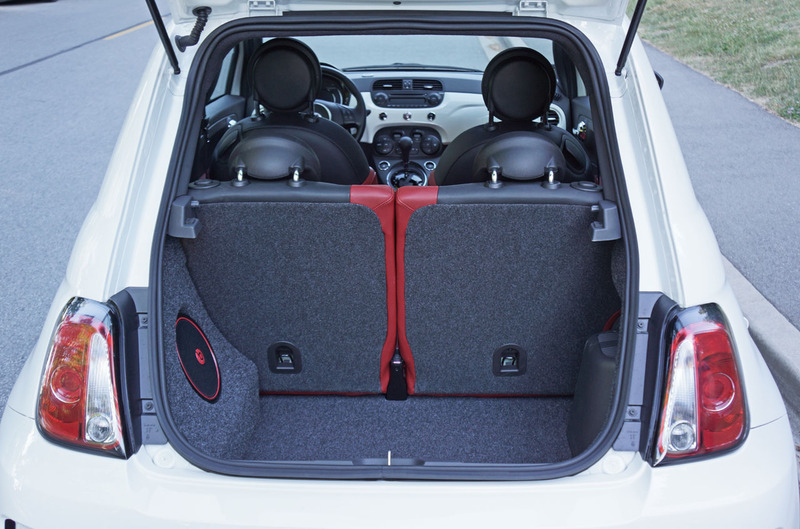 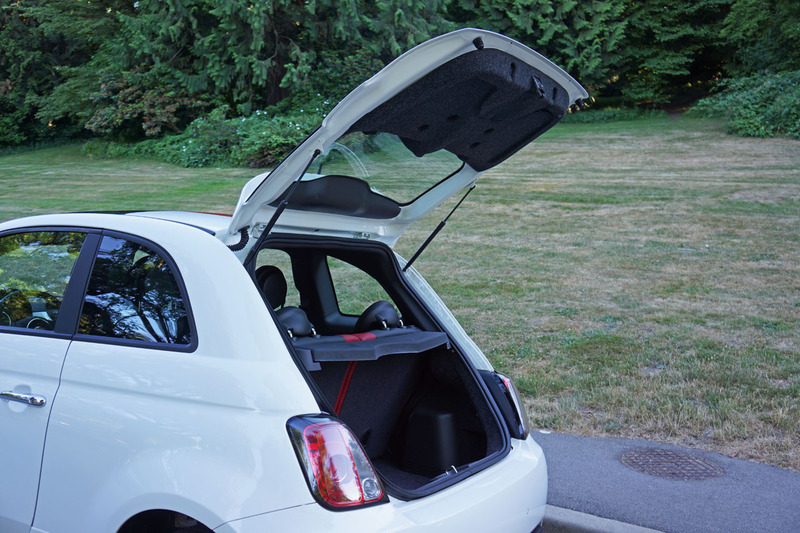 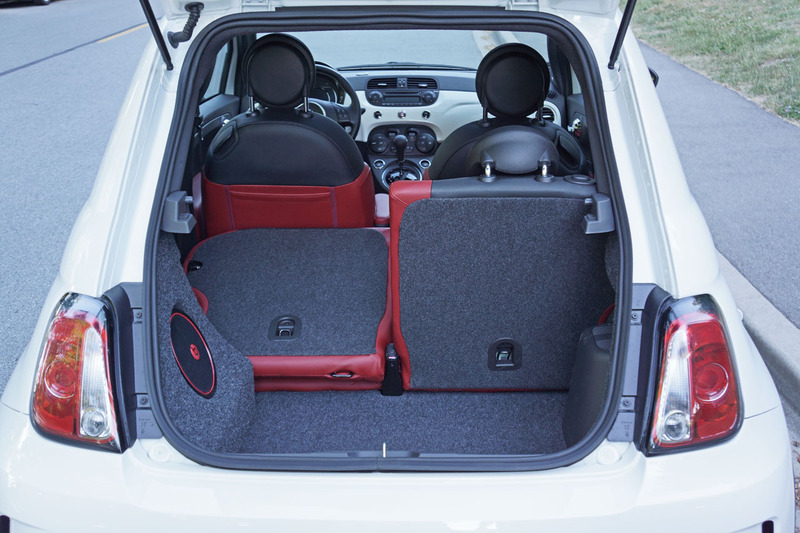 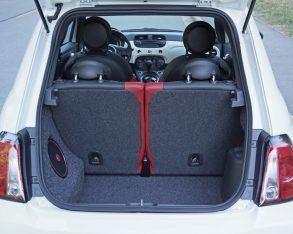 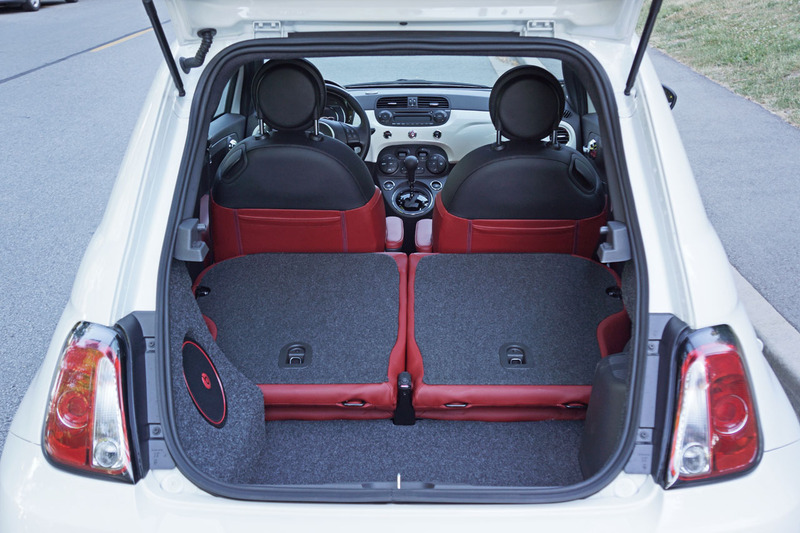 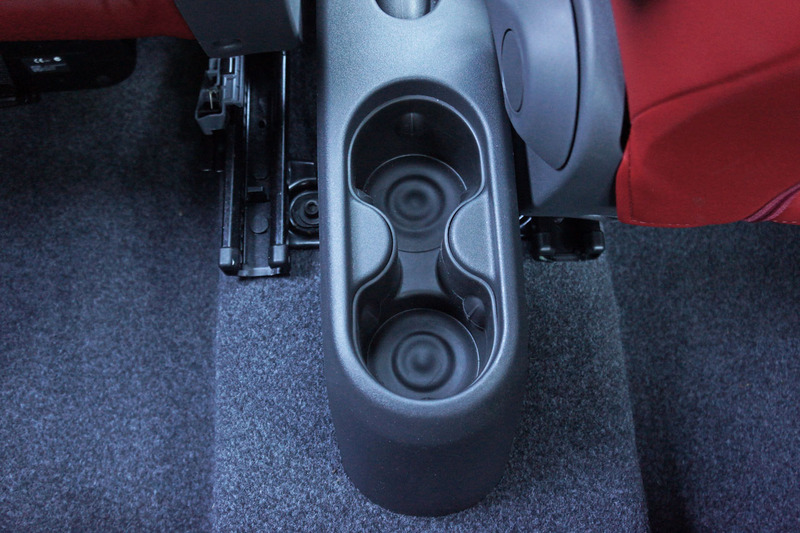 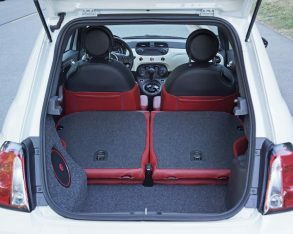 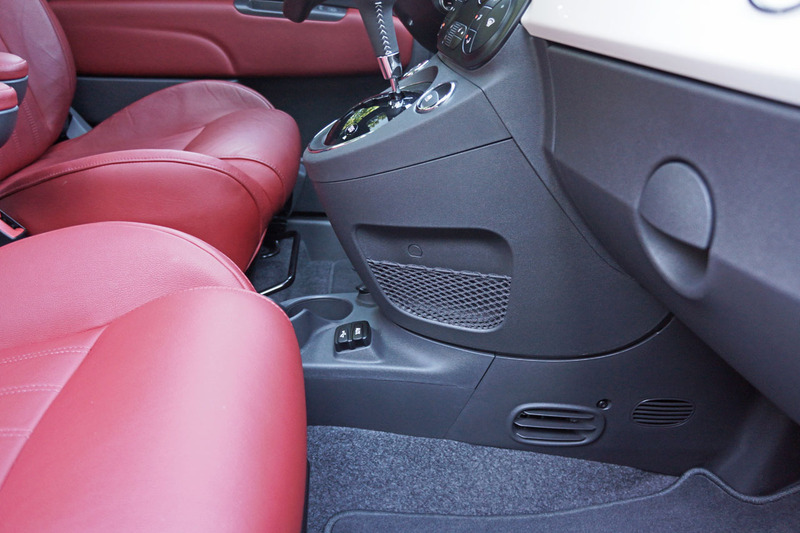 Those rear seats are split 50/50 and fold flat to make the rather compact 184-litre (6.5 cubic-foot) cargo compartment open up to a much more accommodating 496 litres (17.5 cubic feet), while a rear cargo shelf panel keeps personal gear away from prying eyes. 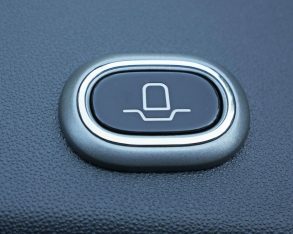 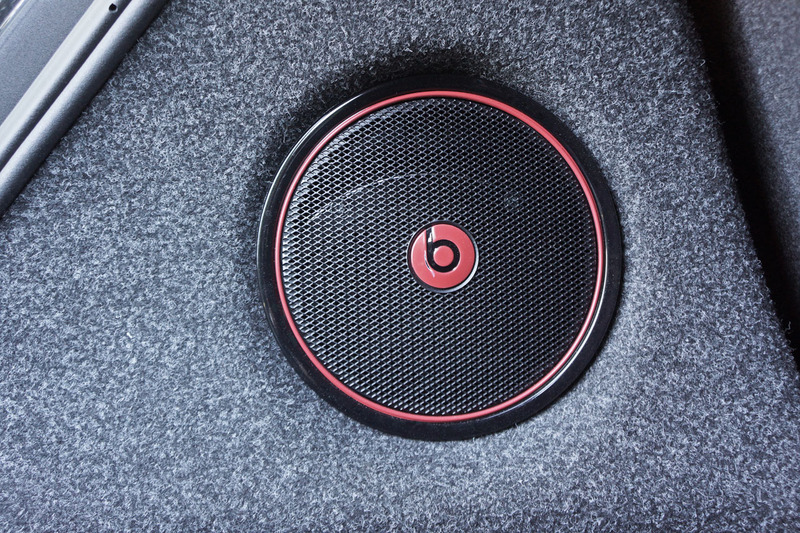 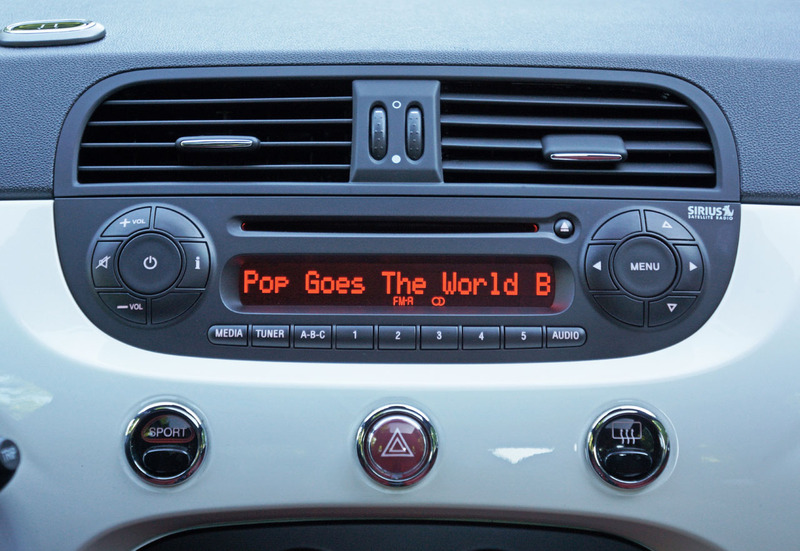 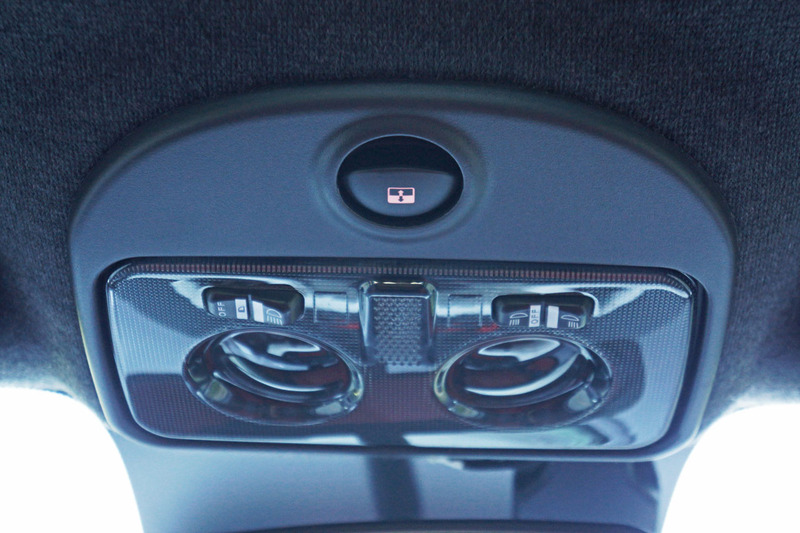 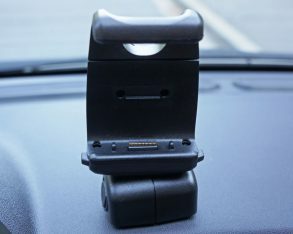 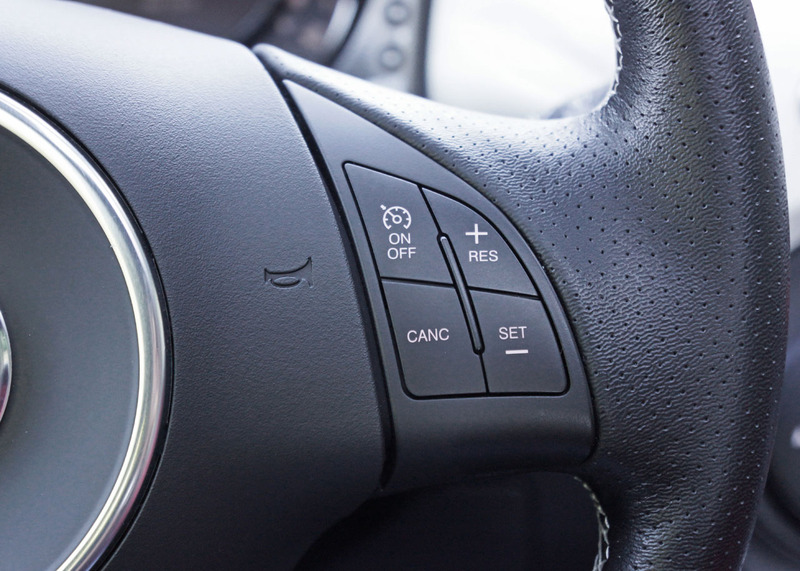 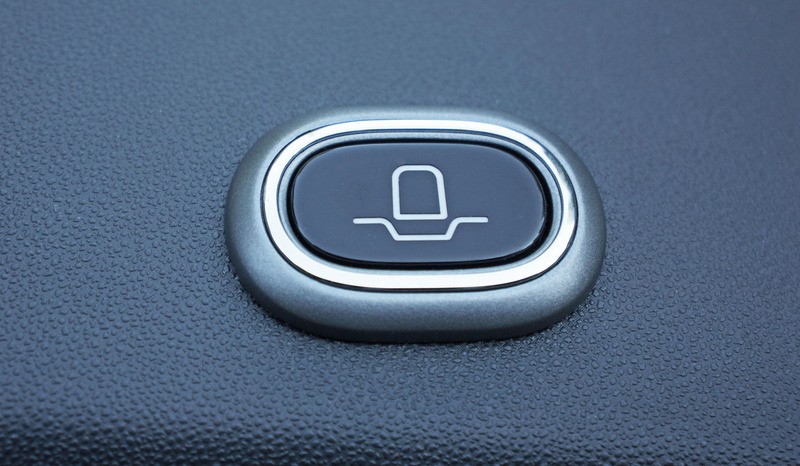 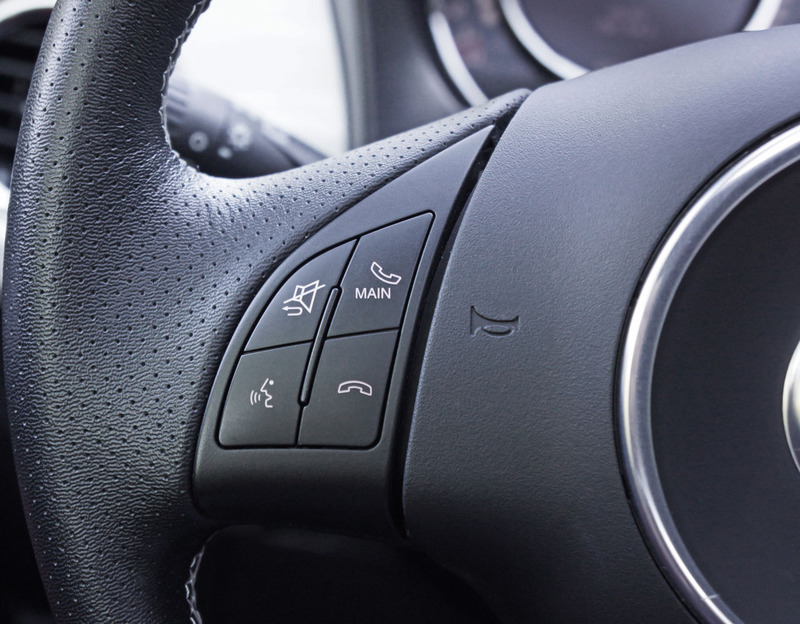 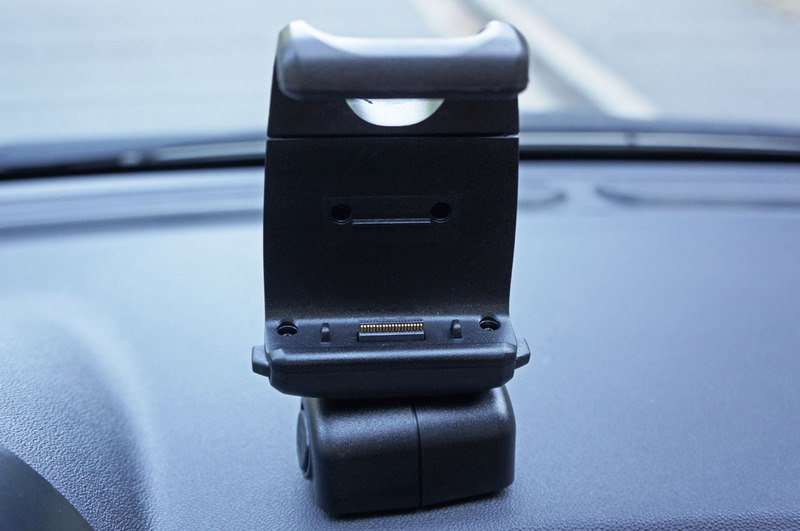 hands-free phone system includes Bluetooth streaming audio for more enjoyment on the road. 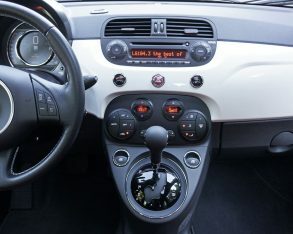 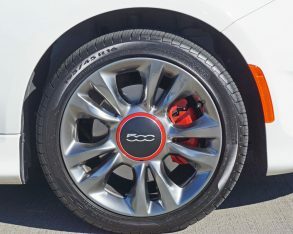 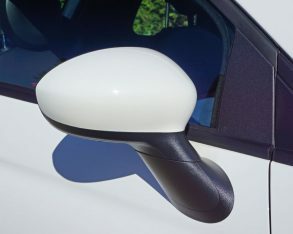 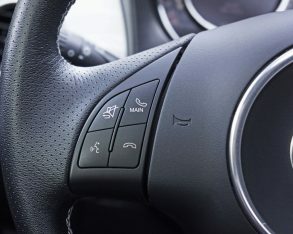 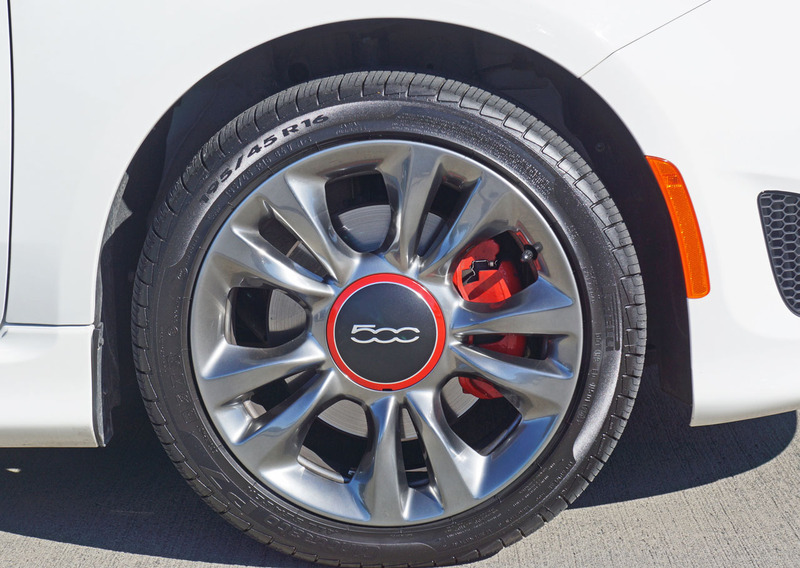 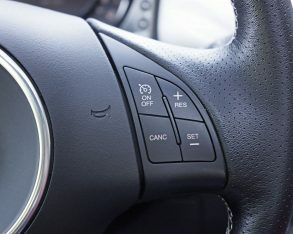 Standard safety features include the upgraded four-wheel performance discs already mentioned, plus ABS and electronic brake-force distribution, traction and stability control, hill start assist, reactive front headrests, tire pressure monitoring, and the usual six airbags plus a driver’s side knee blocker. 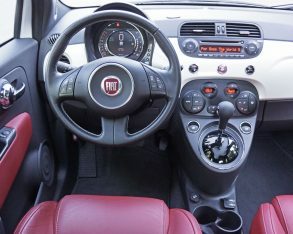 and Convenience package also made time spent with my tester much more enjoyable and a bit safer thanks to automatic climate control, heated front seats, satellite radio with a one-year subscription, and a security alarm, whereas the $1,200 powered glass sunroof visually opened up the already tall interior, and rear parking assist is never a bad idea and therefore well worth the $375 upgrade. 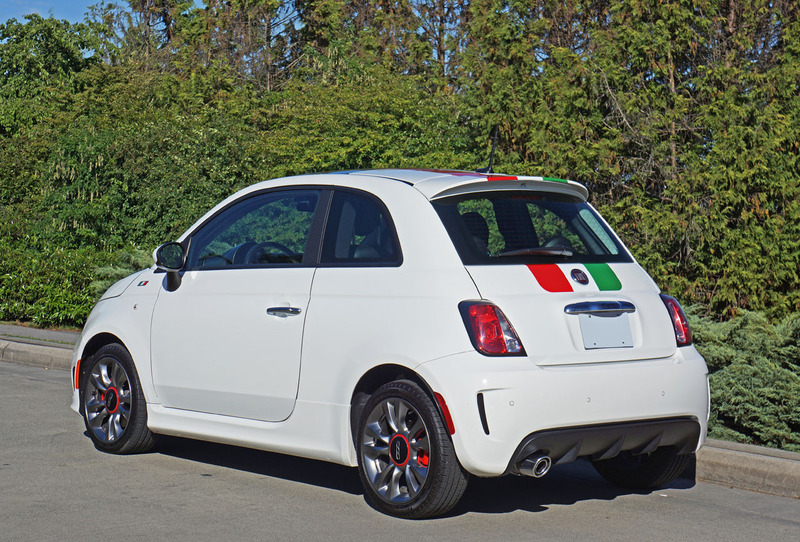 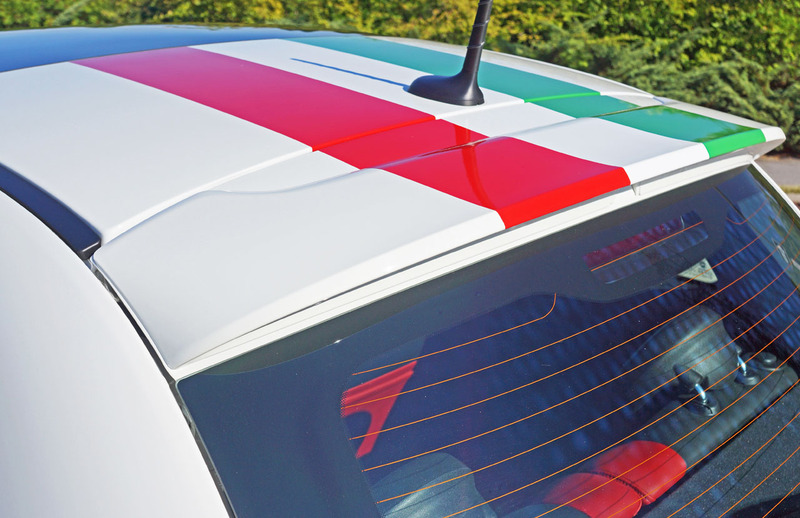 along with Billet Silver, Granite Crystal (grey), Straight Black and Red, officially named Bianco, Billet Argento, Granito Lucente, Nero Puro, and Rosso; everything sounds so much better in Italian, doesn’t it? 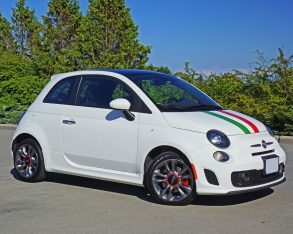 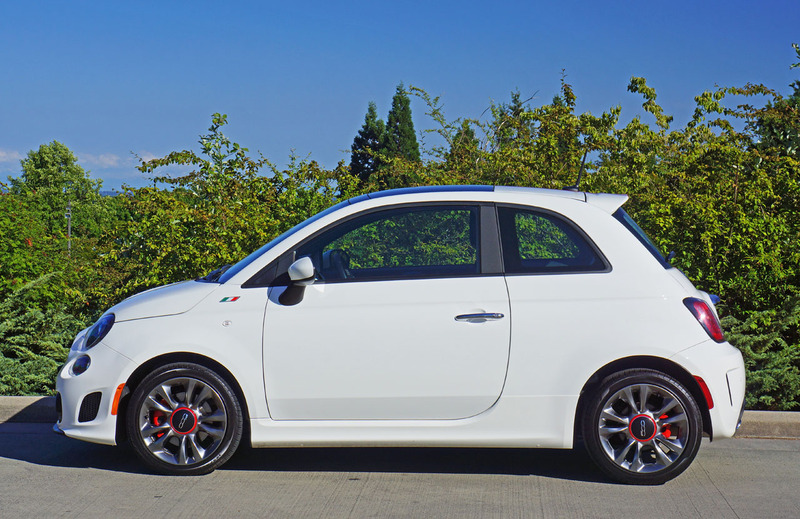 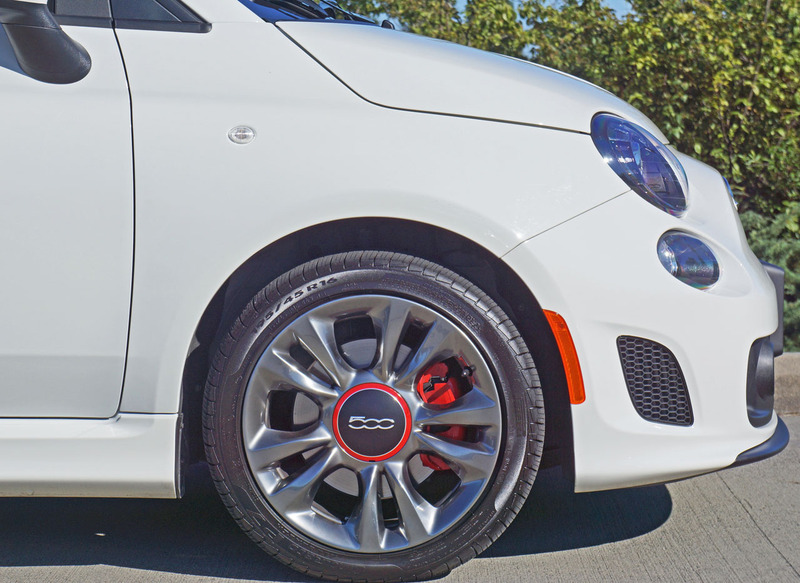 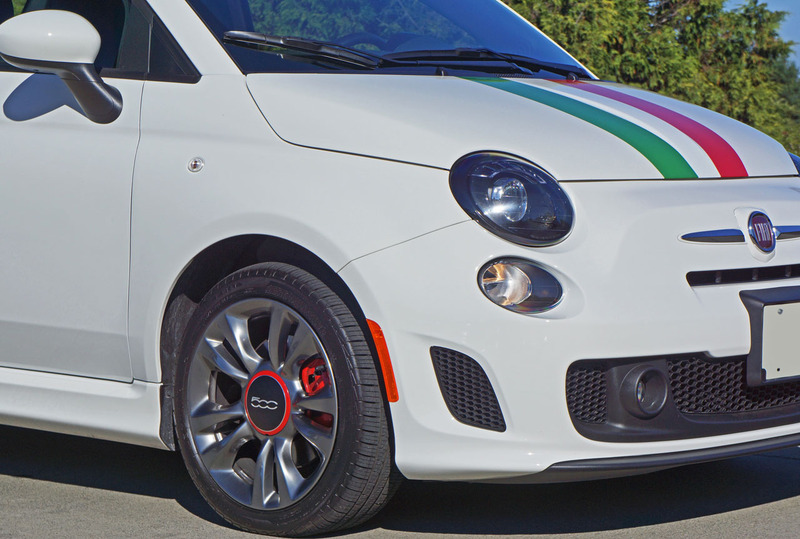 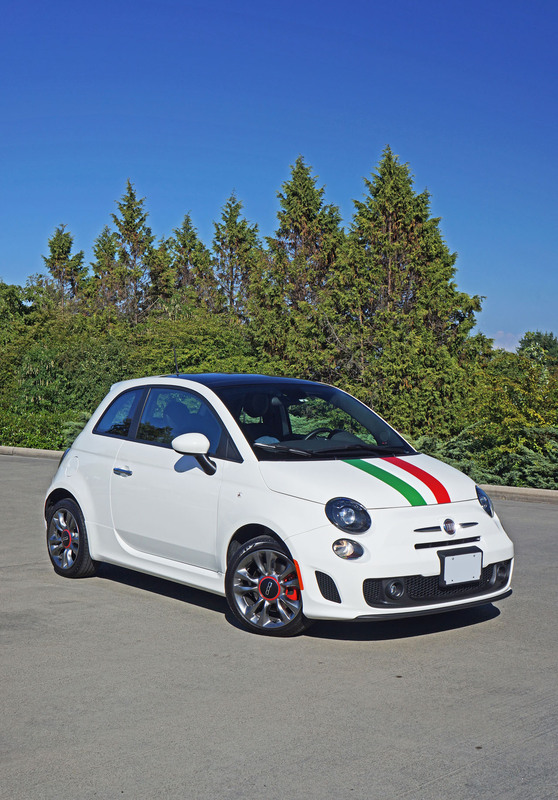 It’s a safe bet that many Fiat buyers who might otherwise opt for an Abarth would choose the 500 Turbo if given the chance to spend time behind the wheel. 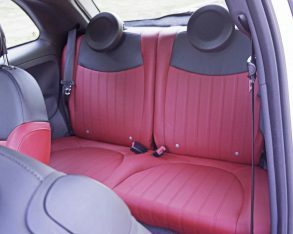 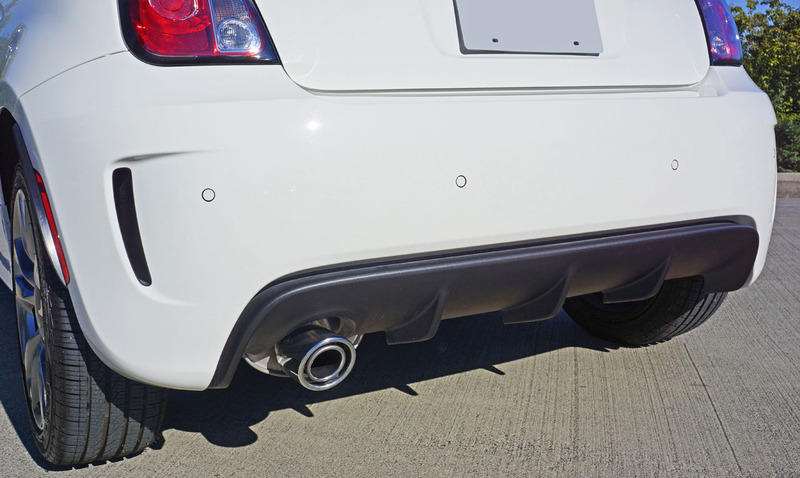 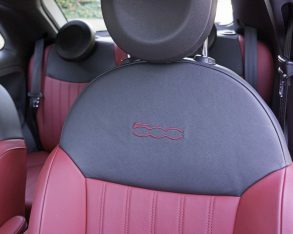 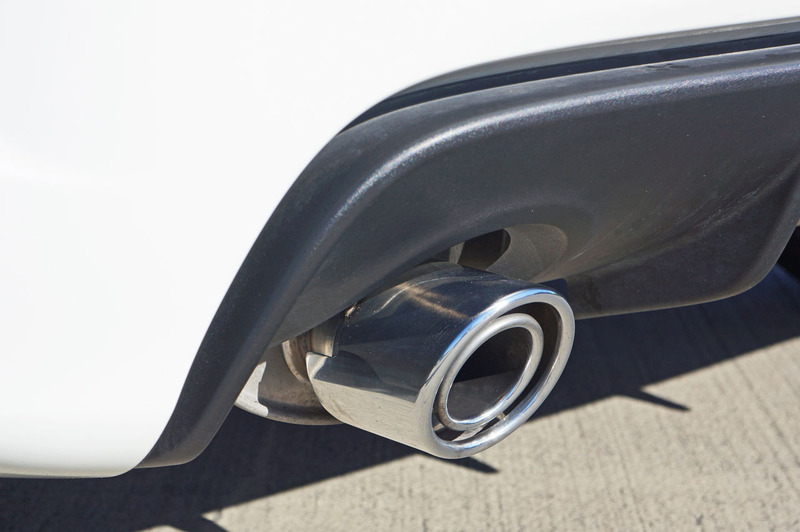 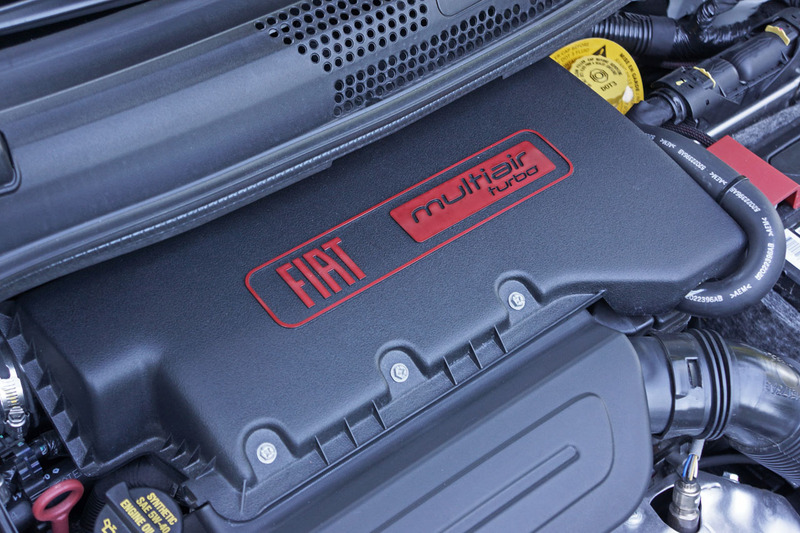 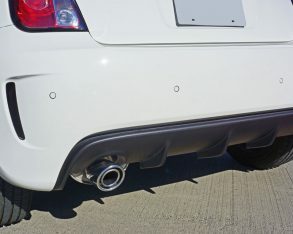 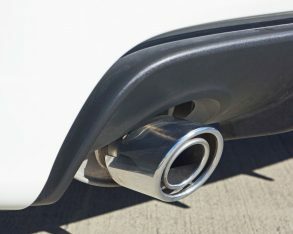 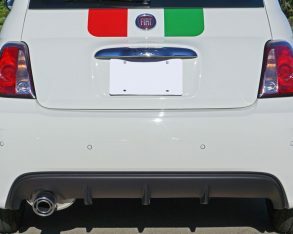 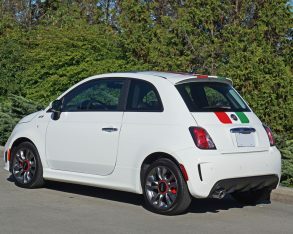 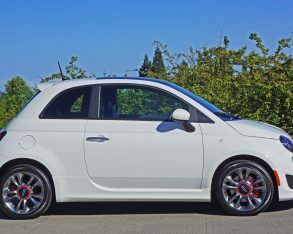 It delivers on much of the Abarth’s styling and performance promise yet does the latter in a much more civilized way, with a quieter yet still exuberant exhaust note that won’t upset the neighbours at daybreak, plus it won’t buzzsaw incessantly through a sickly congested (or hung over) brain during the morning commute. 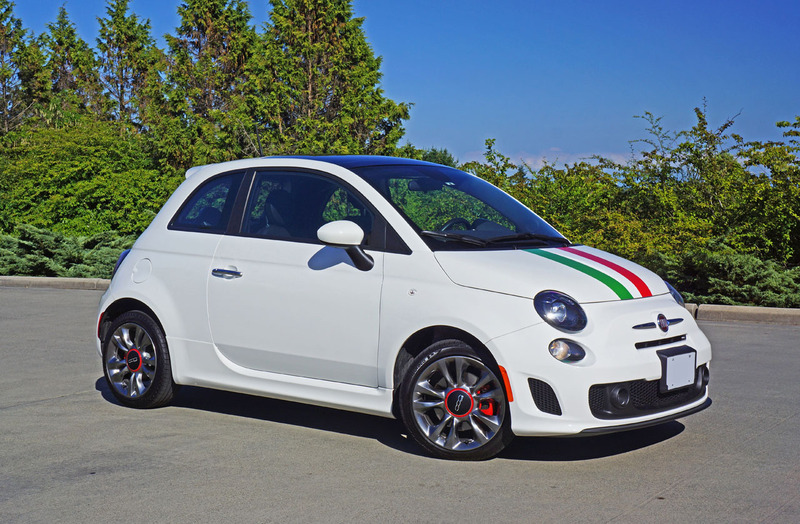 At the same time the 500 Turbo offers a sportier experience than the already fun-loving regular 500, for a price that’s hard to beat. 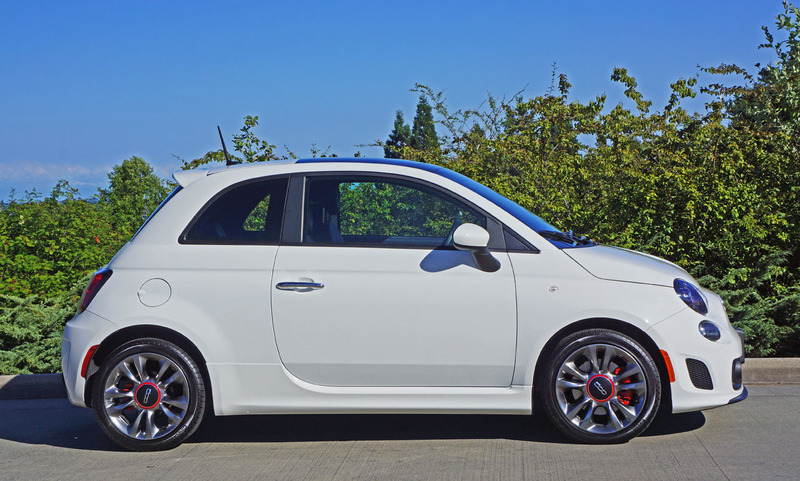 It plays the middle ground in a Fiat 500 world that doesn’t know how to be boring, making it one of my favourite small cars.